The November Uprising in 1830 was a generational experience for the first wave of Polish Romantics. The armed revolt against the Russian occupant was the most significant event of the entire 19th century for contemporary Poles. Over six thousand participants of the uprising were forced to flee the Kingdom of Poland after the insurgency’s defeat. Most of the emigrants were men, officers, commanders, and soldiers fighting in the uprising, as they were most vulnerable to post-uprising repressions. It is not the number of emigrants, however, that constitutes the “greatness” of the movement which today is referred to as the Great Emigration. The greatness of this formation – making foreign lands a common ground for representatives of various groups, civilians and soldiers, laymen and clerics, people injured in the battles and those who never set foot on the battlefield – consists in the joint, though implemented in various ways, effort to bring the idea of independent Poland to life. Frederic Chopin / Chopin "Kills to death"
The post-uprising emigrants set out west, travelling through the Prussian Partition. They were received as heroes in the territory of Germany. Nonetheless, most of the refugees did not stay and travelled on in order to reach France. While the French province welcomed the refugees so cordially that many of them decided to settle there, Paris turned out to be much less hospitable. The municipal authorities dreaded the accumulation of foreign incomers – especially since a significant portion of them were soldiers. The French feared that the newcomers would plot against them, which is why they were initially disinclined towards the budding Polish associations and organisations. Whoever arrived to Paris in the 1830s had the chance to witness the birth of a modern European capital. Industry developed at an impressive rate, the town gained its first railway line, the society underwent cultural changes. Prince Adam Jerzy Czartoryski permanently settled in France in 1834. He had already made a career in the Polish Army, gained experience in government administration and Russian diplomacy, and enjoyed great esteem in the literary circles. He almost instantly became the central figure in a group of people with similar, conservative-liberal views, which with time converted into a de facto political camp, referred to as the “Hotel Lambert camp.” From then on, Hôtel Lambert – located on the Île Saint-Louis, the very centre of the city – became the most important stage of Polish politics in exile and the centre of social and cultural life of Polish emigrees in Paris. Duchess Anna Czartoryska, Adam Jerzy’s wife, being the First Lady in the community of Polish emigrants, asked for donations to support the community. She organised balls, charity fairs, and lotteries in Hôtel Lambert, invited artists to give charitable concerts. She was also the force behind the foundation of the St. Casimir House, established in 1846 – a day-care facility run by the Daughters of Charity and open to this day. Anna Czartoryska also founded the Institute of Polish Maidens. The goal of the institute was, as we would call it today, affirmative action. Thanks to the organisation, many girls in the country and in exile gained access to education, which would have been impossible without the institution’s financial support. It was education, especially primary and secondary education with Polish as the medium of instruction, that constituted one of the most significant preoccupations of the emigrant community. 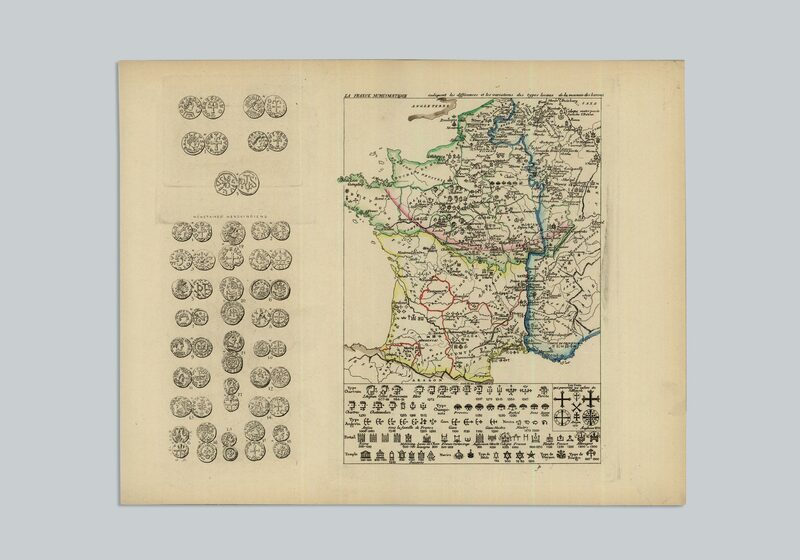 Education received in France led to significant improvement of one’s material situation. Graduates of military schools in Congress Poland had to obtain study permit, but once they started studying, their soldier’s pays were increased. More challenges awaited those who had to choose between studying and finding a job. These people could find help in the Society for Academic Aid, founded by Adam Jerzy Czartoryski in 1832, which ran two schools for children of Polish emigrants and supported students attending secondary schools and universities in Paris. The history of Polish literature traditionally divides the Polish output created between the November and the January Uprising into two groups: works written in the country and in exile. The names of artists writing in the Polish territory are often forgotten even by students at faculties of Polish Studies, while at the same time it is common knowledge that there were three bards working in exile (plus Norwid). The truth is, however, that there were many literary talents in the emigrant community. 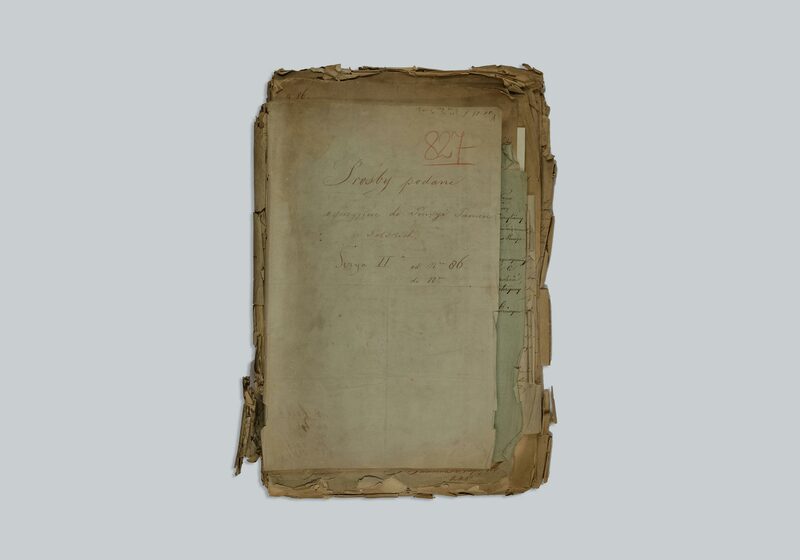 Numerous people belonging to the community picked up the quill pen in order to write down the events of the uprising, express their homesickness or preserve their memories. Nonetheless, it cannot be concluded that – apart from the works of the biggest poets – the emigration community created great, or even good, literature between the two uprisings. Romantics considered everything that surrounded them to be a sign – an indicator or a hieroglyph – of the existence of other planes and beings. They believed that the reality perceived through the senses and fathomable through reason was only a small part of the world and did not constitute the only type of existence. The spiritual needs of the people living in the 19th century were immense. This trend did not escape Polish emigrants in the Romantic Paris, who suffered from loneliness and poverty and missed their families. All this bonded them and pushed them towards one another, while also bringing them closer to the church, which was not always able to satisfy their aroused spiritual hunger. The Circle of God’s Cause, established by Andrzej Towiański in Paris, had a religious system, writings explaining its doctrine, its own relics and rituals, even its particular language, since it was impossible to speak of the new programme of spiritual development without creating neologisms. Słowacki joined the Circle of God’s Cause on 12 July 1842 and this event changed his life. Brother Juliusz felt comfortable not only among the members of the Circle, but also with the organisation’s religious doctrine and programme of spiritual revival. Nonetheless, he eventually broke his ties with the Circle. Upon his break, Słowacki had already started to undergo spiritual transformation, which soon afterwards became the basis of his own concept of faith. Leaving the Circle was not Juliusz Słowacki’s first disappearance. Having arrived to Paris in 1831, he initially was enthusiastic to participate in the public life of the emigree community. 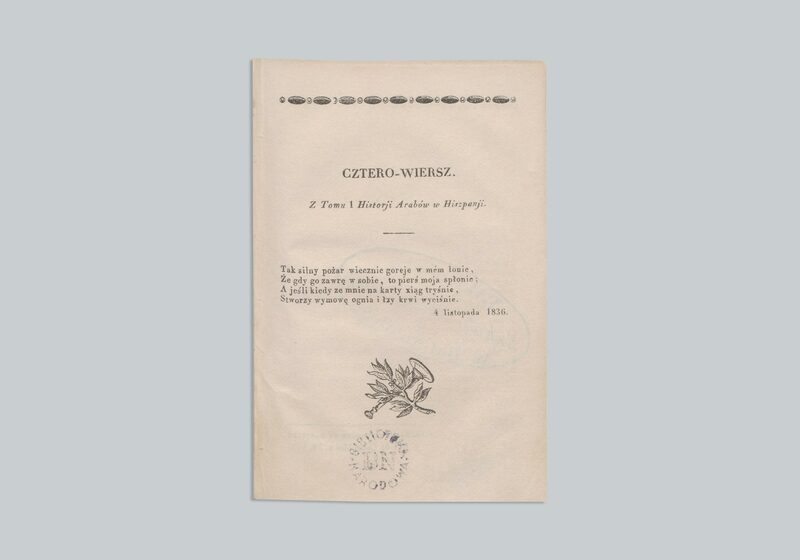 Over the course of less than a year, however, he started to harbour negative feelings towards the community, which appreciated neither Słowacki’s two newly published collections of poems nor his personality. And so away he went. For emigrants, forming societies and spending time together was on one hand an escape from loneliness, and on the other – an opportunity to cooperate and achieve spiritual or national goals. It is not surprising, therefore, that numerous societies of various profiles started to be created in Paris in the early 1830s. Seeing that the priority of all emigrants was regaining independence and shaping the new Polish State, the most important discussions took place in political associations. Political factions published their own newspapers, which served as soapboxes for their views. One of the most significant associations working in exile was the Literary Society. Among its members there were some of the biggest figures of the Emigration. The Polish Library in Paris was established in 1838 by the Literary Society with its branches and the Society for Academic Aid, which aimed to raise funds necessary to buy a seat for the institution, mostly through private donations. 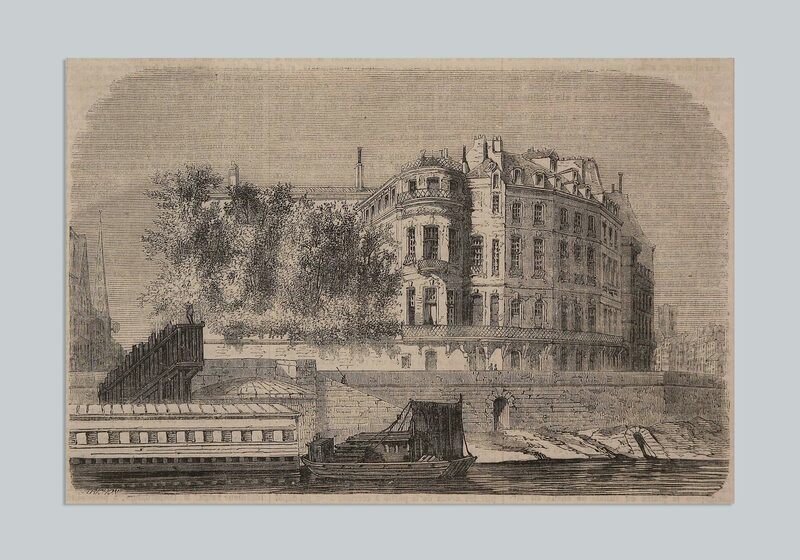 The library eventually found its location on the Île Saint-Louis, in a building situated at Quai d’Orléans. The Polish Library, which initially stored collections of the Literary Society and the Society for Academic Aid, served as a counterbalance to Nicholas I’s attempts to annihilate the Polish culture. In the process of Depolonisation, Polish libraries were liquidated and dismantled, while their most valuable resources were sent out to Russia. The collection of the Polish Library quickly expanded – some of the people who handed over their private collections to the organisation were Niemcewicz and Bem. 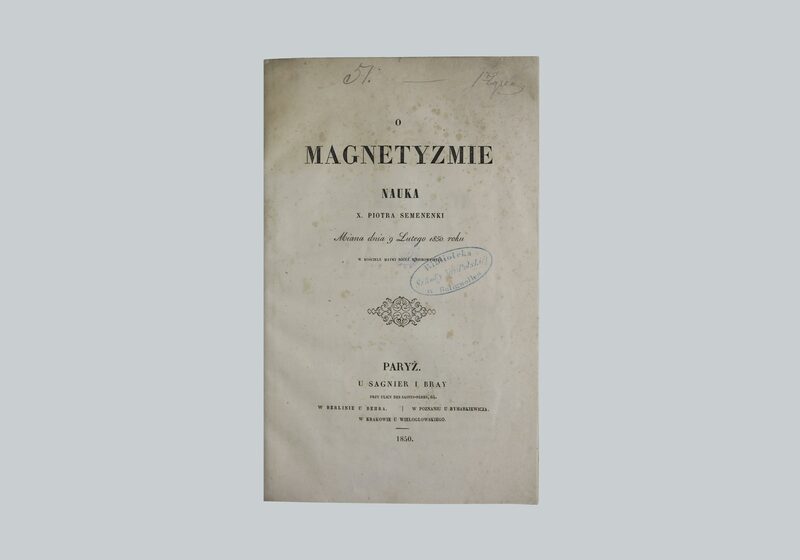 The Adam Mickiewicz Museum was established by the Library in 1903; its collection was composed of manuscripts, keepsakes, and other materials connected with the artistic output of the author of Dziady and Pan Tadeusz, all donated to the institution by Władysław Mickiewicz. I do not know if any Poland will ever exist, but I am certain there will never be any Poles (quote attributed to Nicholas I of Russia). The November Uprising was a generational experience for the first wave of Polish Romantics – even those who did not participate in the rebellion themselves. The armed revolt against the Russian occupant was the most significant event of the entire 19th century for contemporary Poles. It also became the most important – either overt or implied – theme of the Polish culture and literature in the Romantic period. Some twenty young plotters “took up bayonets” on the night of 29/30 November 1830. They were soon joined by almost fifteen thousand other fighters – soldiers of the insurgent army and recruits. As the rebellion expanded, the number of combatants increased up to – as it is estimated today – 120,000 men, almost as many people as there were living in Warsaw at the time. The diplomats sent out by the insurgent government made futile attempts to gain support from Paris and London. Europe refused to perceive the events of 1830-1831 as a national uprising and treat Poles as a side in the conflict, leaving them at the mercy (or lack thereof) of Emperor Nicholas I, who at the time officially bore the title of the King of Poland. Over six thousand participants of the uprising were forced to flee the Kingdom of Poland after the insurgency’s defeat. Most of the emigrants were men, officers, commanders, and soldiers fighting in the uprising, as they were most vulnerable to post-uprising repressions. Few of those having families decided to bring them along to their restless journey. It is currently estimated that women constituted only a small percentage of the people migrating from the country after 1831. The post-uprising emigrants set out west, travelling through the Prussian Partition. They were received as heroes in the territory of Germany, where the local inhabitants welcomed them with dinner parties and invited them to their houses. Nonetheless, most of the refugees did not stay and travelled on in order to reach France. 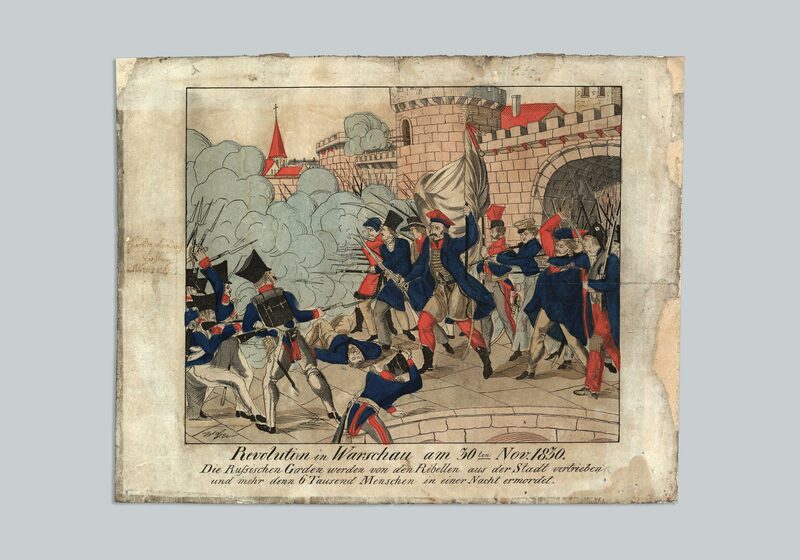 The Frenchmen who took to the streets in July 1830, protesting in defence of the civil and political liberties threatened by the absolutist ambitions of Charles X, were ideologically close to the Poles fighting for their freedom and statehood. Newspapers published at the time contain allegorical illustrations depicting Frenchmen mourning over the graves of their Polish brothers. 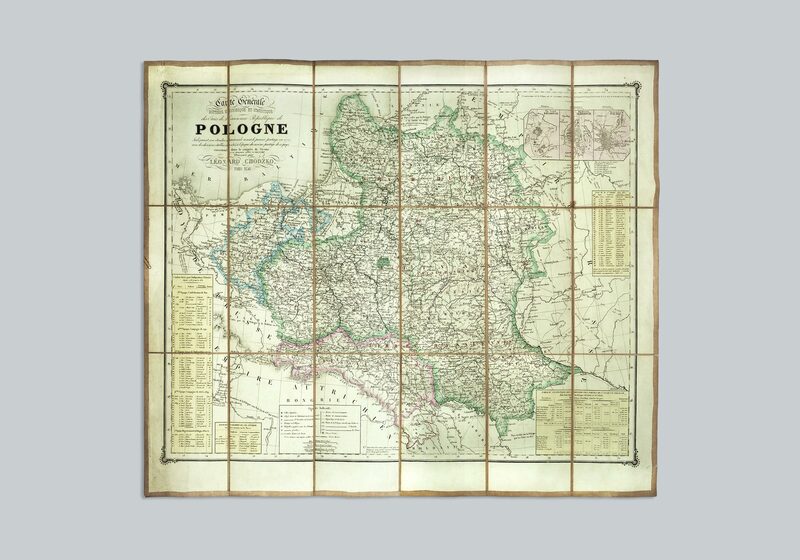 Despite the nationwide respect for the pursuit of liberty of Poles devoid of their homeland, however, France under the reign of Louis Philippe sought to maintain good relations with the Russian Empire. This naturally impacted the way Polish emigrants were received in the country. While the French province welcomed the refugees so cordially that many of them decided to settle there, Paris turned out to be much less hospitable. The municipal authorities dreaded the accumulation of foreign incomers – especially since a significant portion of them were soldiers. The French feared that the newcomers would plot against them, which is why they were initially disinclined towards the budding Polish associations and organisations. 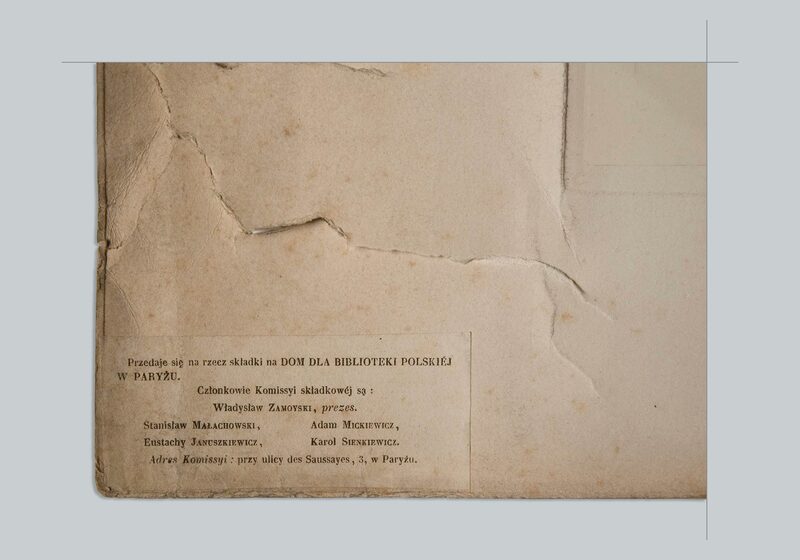 According to biographers of Adam Mickiewicz, the poet himself – having been deported to Russia from Vilnius as early as in 1824, following the sentence in the Philomats trial – had to use malle-poste, a mail coach, to arrive to the French capital without having to show his documents. Whoever arrived to Paris in the 1830s had the chance to witness the birth of a modern European capital. Industry developed at an impressive rate, the town gained its first railway line, the society underwent cultural changes. In the 1840s the population of Paris reached a million inhabitants, making it the second – after London – largest town of Europe. (Nowadays, there are over two million people living intra-muros – within the original boundaries of the town – and six times as many in the entire urban agglomeration). The economic and industrial progress brought about the development of culture. 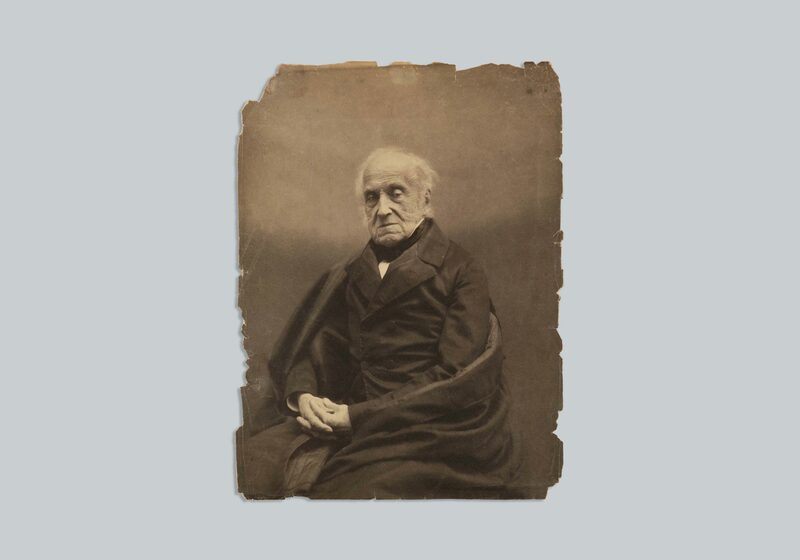 Among the writers who had made their début before 1832 there were Lamartine – the founding father of French Romanticism – as well as Balzac, Victor Hugo, Stendhal. At that point, the second generation of Romantics was starting to take over. 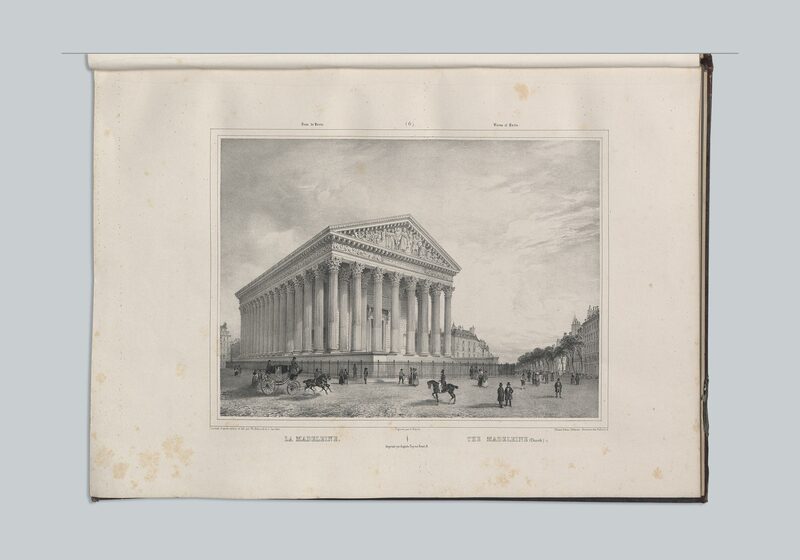 It is probable that many of the Poles who saw the French capital for the first time did the same thing as Ignacy Domeyko, rushing “forward to see the Tuileries [Palace],” the Champs-Élysées or the almost finished La Madeleine church. Nonetheless, they were not merely tourists – Paris was to become their new home. Hôtel Lambert is not actually a hotel. When travelling to various French towns, nobody will find accommodation at Hôtel de Ville – the Town Hall. In French, the word hôtel usually referred to a big, detached edifice, a municipal palace. 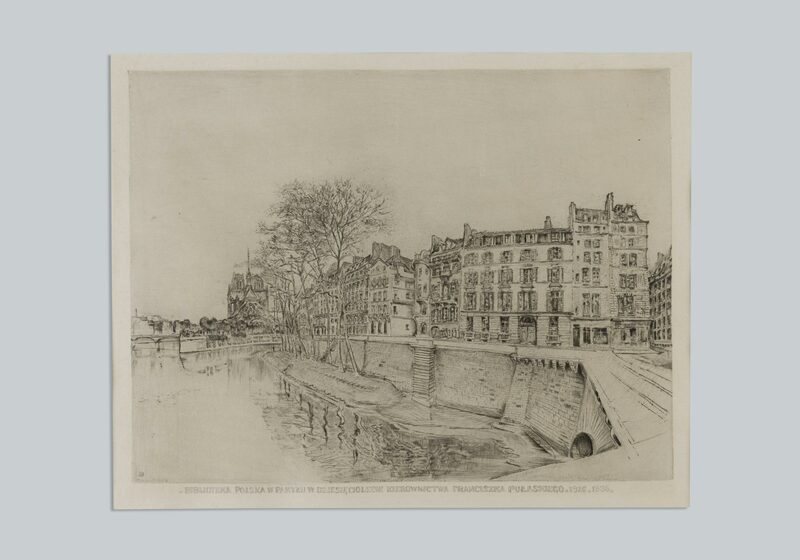 It was precisely that type of building, erected in the 17th century and located on the Île Saint-Louis – the very centre of Paris – that Anna Sapieżyna nee Zamoyska bought in 1843, encouraged by Frédéric Chopin, who had been informed about the vacancy by Eugène Delacroix. Having acquired the real estate, she handed it over to her daughter Anna Czartoryska nee Sapieha and her son-in-law Adam Jerzy Czartoryski. From then on, Hôtel Lambert became the most important stage of Polish politics in exile and the centre of social and cultural life of Polish emigrees in Paris. Upon the outbreak of the November Uprising, Czartoryski had already made a career in the Polish Army, gained experience in government administration and Russian diplomacy, and enjoyed great esteem in the literary circles. Russians sentenced Prince Adam Jerzy to death for his involvement in the activities of the executive power (he headed the government) during the uprising. In order to evade execution, the prince was forced to flee first to England and then to France. He permanently settled in France in 1834. He almost instantly became the central figure in a group of people with similar, conservative-liberal views, which with time converted into a de facto political camp, referred to as the “Hotel Lambert camp.” Adam Jerzy Czartoryski was an advocate of the cabinet system – he had high hopes for diplomatic activities aimed at focusing the attention of European powers on the predicament of partitioned Poland. The prince’s royalist supporters saw him as the perfect candidate for the future king of the liberated homeland. It is important to note that the activity of Hôtel Lambert was not limited to politics. At one point, the building became the temporary seat of the Princes Czartoryski collection – resources of one of the most prominent private museums of the 19th century, established in Puławy by Adam Jerzy’s mother – Duchess Izabella Czartoryska nee Flemming. People organised around Hôtel Lambert aimed to promote the development of Polish culture and education and carried out academic activities. Last but not least, Czartoryski’s circles sought to improve the situation of Polish migrants by founding charities and collecting funds to provide welfare for the poorest, an initiative which benefited from the active involvement of Adam Jerzy’s wife – Duchess Anna Zofia Czartoryska nee Sapieha. “It has been over a year since [our sisters] disclosed their worries to each other and founded an association, handing over the helm to Duchess Anna Czartoryska, well-experienced in charitable activity. From then on, they have tirelessly sought for the ways in which to alleviate even the shortest moments of suffering of the noble victims of the civil struggle,” wrote Kronika Emigracji Polskiej in 1835. It is true that the “victims of the civil struggle” often faced difficult financial conditions. 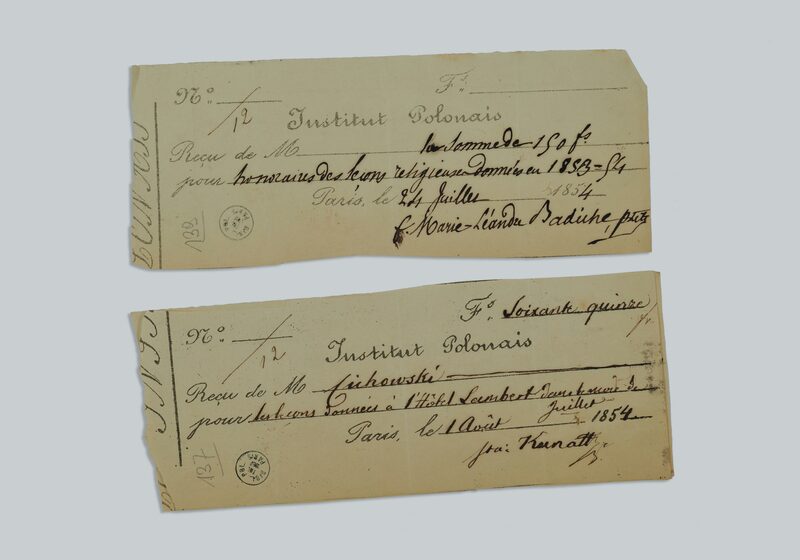 Three quarters of the community of Polish emigrants in France was composed of soldiers, who received soldier’s pays from the French Government. With time, however, the pays became lower and lower – a colonel who initially received 62 franks was soon forced to survive on mere 25 franks. Not to mention that one needed a place to live in and food to eat, some people also required medical attention as they had suffered injuries in the battle. Even worse predicament befell civilians with no property to their name, often entire families. The Charitable Society of Polish Ladies, established by Anna Czatoryska in 1834, did everything in its power to meet the most urgent needs – provide care for the sick, women with children, orphans and widows, provide assistance to those who had been overlooked by the French welfare, support the unemployed in their search for work. In the first year of its activity, the society, with Klementyna Hoffmanowa working as its vice-president, provided help to 360 people in need. The members of the organisations handed out clothing, helped people pay rent, partially paid for medical care and travels, sponsored prosthetics to those who needed them. How to collect funds for all those activities? 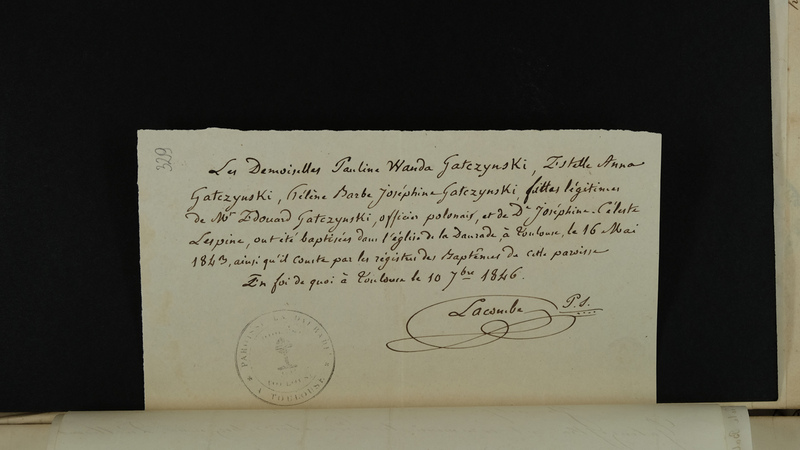 Czartoryska, being the de facto First Lady in the community of Polish emigrants, asked for donations among her own people and the local population, in France and beyond. 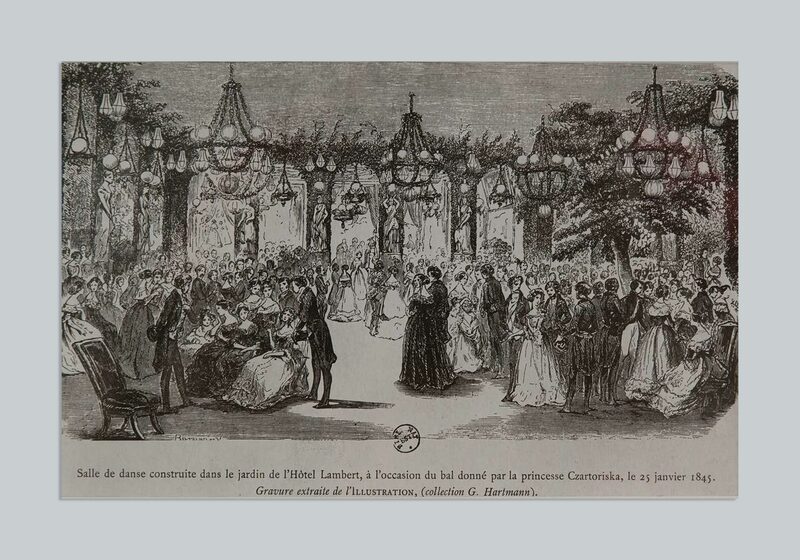 She organised balls, charity fairs, and lotteries in Hôtel Lambert, invited artists to give charitable concerts. She was also the force behind the foundation of the St. Casimir House, established in 1846 – a day-care facility run by the Daughters of Charity and open to this day, the place of death of Cyprian Nowid in 1883. Anna Czartoryska also founded the Institute of Polish Maidens, with one of the board members being Klementyna Hoffmanowa nee Tańska – the author of numerous children’s books and probably the first Polish female writer to be able to make a living out of writing alone. The goal of the institute was, as we would call it today, affirmative action. Thanks to the organisation, many girls in the country and in exile gained access to education, which would have been impossible without the institution’s financial support. It was education, especially primary and secondary education with Polish as the medium of instruction, that constituted one of the most significant preoccupations of the emigrant community. Another issue it faced was higher education. Almost a fifth of all Polish refugees living in exile attempted to continue to develop their academic careers brought to a halt by the uprising. Students also needed to be taken care of. Education received in France led to significant improvement of one’s material situation. Graduates of military schools in Congress Poland had to obtain study permit (only those applying to study medicine were not required to do so), but once they started studying, their soldier’s pays were increased. More challenges awaited those who had to choose between studying and finding a job. In 1835, General Józef Bem established the Polytechnic Society supporting technical education. Bem, himself attending the Paris-based École Nationale des Ponts et Chaussées (School of Bridges and Roads), was also engaged in promoting self-education with the use of mnemonic techniques. He understood the importance of engineer education in the times of rapid technological and industrial changes but did not forget about artistic talents. During the first year of its activity, the society helped 81 people enrol in higher education facilities – 26 of them studied in the Paris Technical Institute and École Centrale des Arts et Manufactures, a school with similar profile. Many Polish students also enrolled in the aforementioned École Nationale des Ponts et Chaussées (bridges and roads) and the prestigious École des Mines (mining). One of the graduates of the latter school was Ignacy Domeyko. Interned in Prussia after the November Uprising, Domeyko met Mickiewicz in Dresden and the two men left for Paris in a mail coach, as we have already mentioned. In the French capital, Domeyko joined the Society for Academic Aid, finished his studies and set out on his academic journey to Chile. There was no shortage of diverse academic talent in the community of the Great Emigration. Suffice it to mention Joachim Lelewel – a historian, geographer and cartographer, bibliologist, researcher of heraldry, linguist, educator. He combined academic work with activities in the field of politics, particularly the democratic camp, for which he was eventually exiled from Paris. Academic undertakings did not exhaust the creative energy of the emigrants. While academic talents discovered in exile flourished, however, people developing their artistic careers in Paris – especially in the field of literature – often experienced hardships. The history of Polish literature traditionally divides the Polish output created between the November and the January Uprising into two groups: works written in the country and in exile. 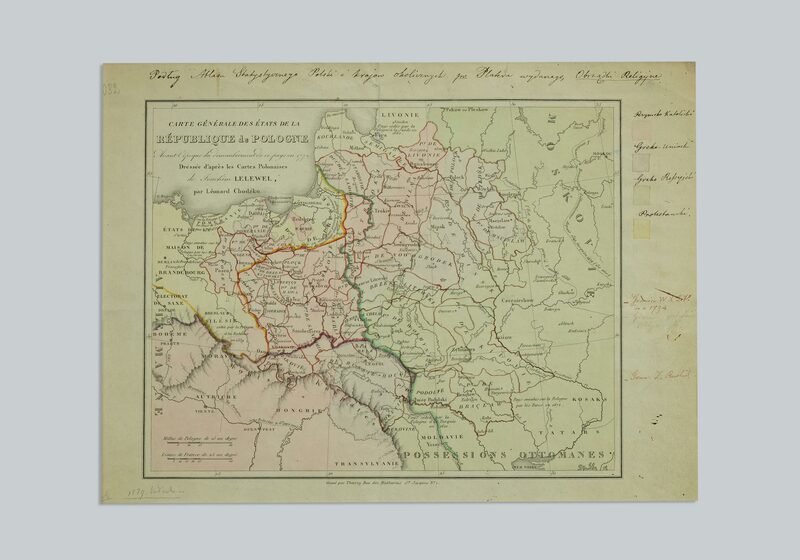 The names of artists writing in the Polish territory are often forgotten even by students at faculties of Polish Studies, while at the same time it is common knowledge that the Polish romantic literature was created abroad and there were three bards working in exile (plus Norwid). The truth is, however, that there were many smaller literary talents in the emigrant community. In 1795, Adam Jerzy Czartoryski himself wrote his biggest poetic masterpiece – Bard polski [Polish Bard], published in Paris as late as in the 1850s. 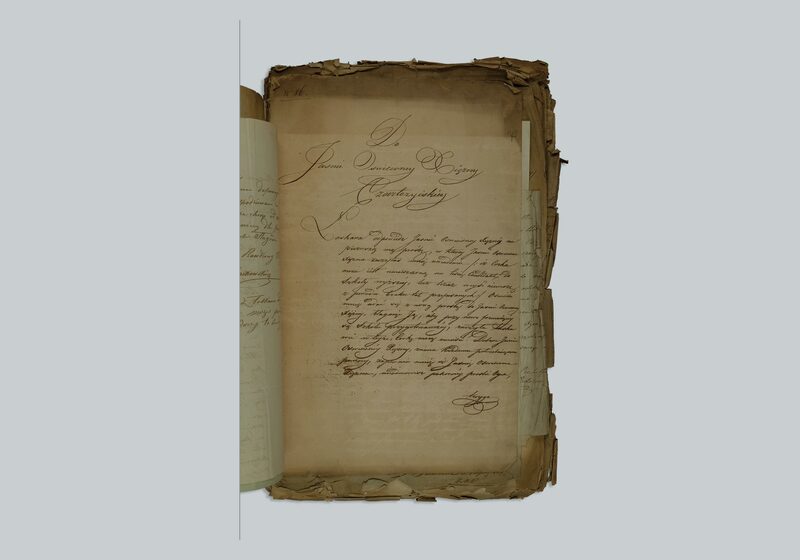 Numerous people belonging to the community of Polish emigrants picked up the quill pen in order to write down the events of the uprising, express their homesickness or preserve their memories. Nonetheless, it cannot be concluded that – apart from the works of the biggest poets – the emigration community created great, or even good, literature between the two uprisings. 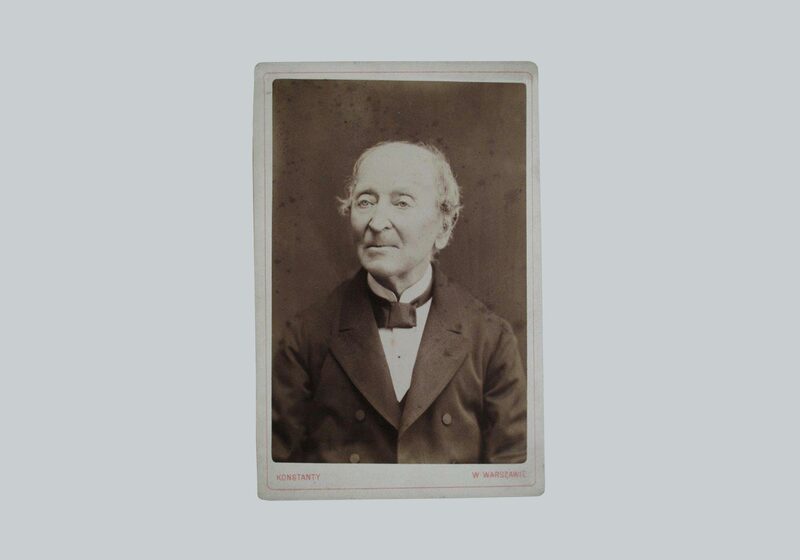 Upon his arrival to Paris, Julian Ursyn Niemcewicz – the father of the Great Emigration, as he was referred to – had already gained the experience of an emigree, prisoner, diplomat, member of the Society of Friends of Science, and most importantly – of a writer. Niemcewicz wrote almost until his very death (he passed away in Paris in 1841), only chronologically belonging to the Romantic era of literature, which in Poland began with the publication of Ballads and Romances by Mickiewicz in 1822. The output of the author of Śpiewy historyczne [Historical Songs], however, represented the former literary period. The prominence of Niemcewicz, a representative of Classicism and the Enlightenment, in the emigration community derived from great respect for his achievements in the field of literature, but also politics and… life. The best evidence of this esteem is the poet’s tombstone in the Montmorency Cemetery located right outside Paris. Niemcewicz lays in the same mausoleum as another great authority of the emigration community – Karol Kniaziewicz, who fought beside Kościuszko, served as the acting representative of the National Government after the defeat of the uprising, and was a talented painter. Both of them are commemorated with a memorial monument by Władysław Oleszczyński in the St. Martin collegiate church in Montmorency, which depicts the two “great nestors” lying one next to the other, emerged in the eternal sleep. 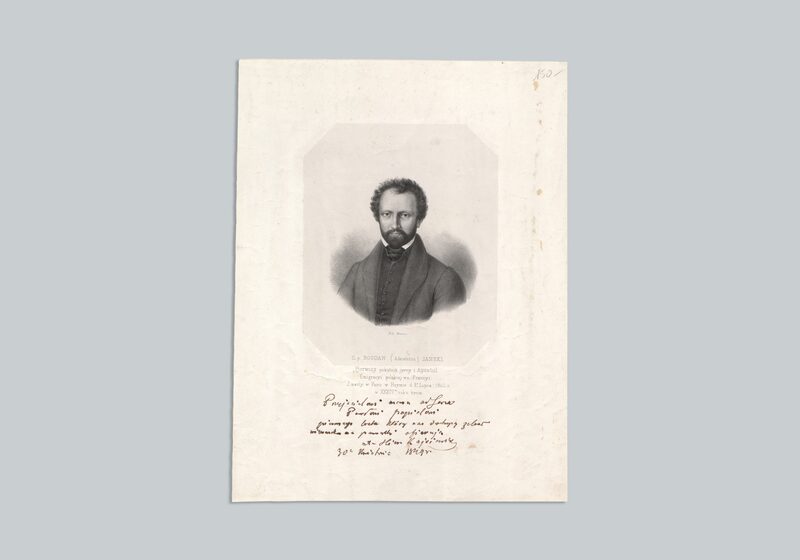 Franciszek Grzymała had been an active literary critic and poet in Warsaw and published only several poems after his arrival to Paris in 1832. 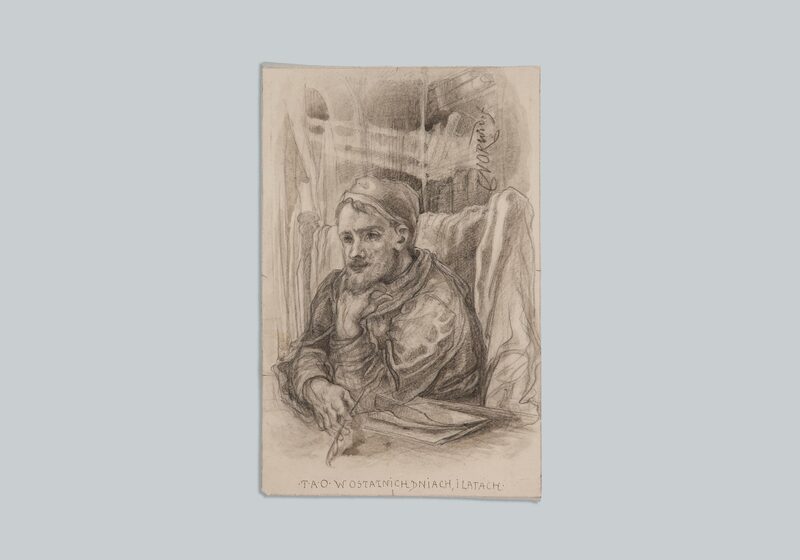 Following the defeat of the uprising, Aleksander Chodźko, who was a decade younger than Grzymała and had released a collection of poems in 1829, devoted himself primarily to translating poetry – from Persian. He published numerous treatises on linguistics, developed a Polish-English dictionary, and eventually assumed the post of the head of the Slavic Literature Institute in Collège de France, taking the position over from Mickiewicz. 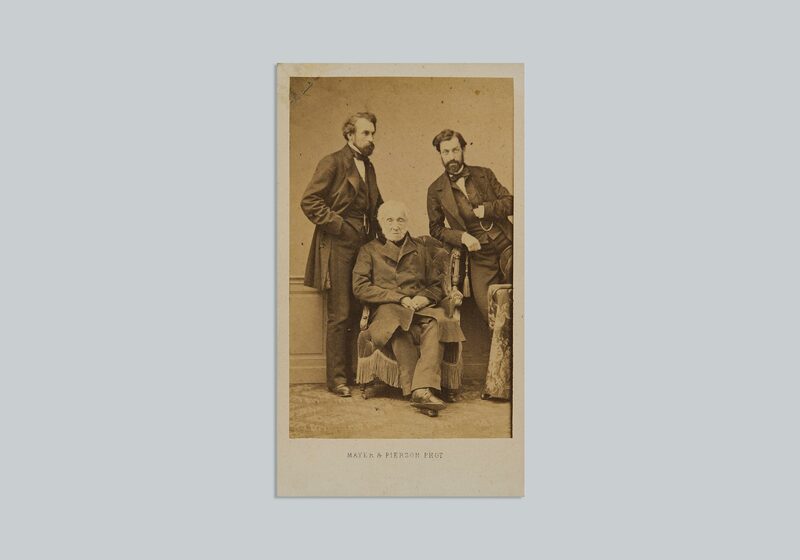 Seweryn Goszczyński and Józef Bohdan Zaleski, nowadays considered to be representatives of the Ukrainian school, or the so-called “Dark Romanticism,” continued to write in exile, at the same time engaging in the social and political life of the emigree community. With time, however, they started to prioritise religious activity over their literary output. Zaleski joined the group that would later be known as the Ressurectionists, while Goszczyński became a member of the Circle of God’s Cause – the so-called “Towiańczycy.” Religion started to permeate the entire ambience of Paris near the year 1840. In 1834, Adam Mickiewicz and Bogdan Jański, a lawyer and economist, as well as the poet’s trusted friend, established the United Brethren – a religious society, among whose members there were Ignacy Domeyko and Józef Bohdan Zaleski. The members of the society gathered together to pray and make plans of the spiritual revival of the emigrant community and the church, which would result in Poland regaining independence. The so-called House of Jański was established several years later; it was a place where young men seeking closer relations with God lived and worked together, just like a religious fraternity which they eventually converted into. In 1842, Hieronim Kjsiewicz and Piotr Semenenko established the Congregation of the Resurrection of Our Lord Jesus Christ, nowadays still known as the Ressurectionists. The Ressurectionist were forced to quickly and – let us say it frankly – unsuccessfully save Mickiewicz, their de facto founder, from his spiritual oppression. 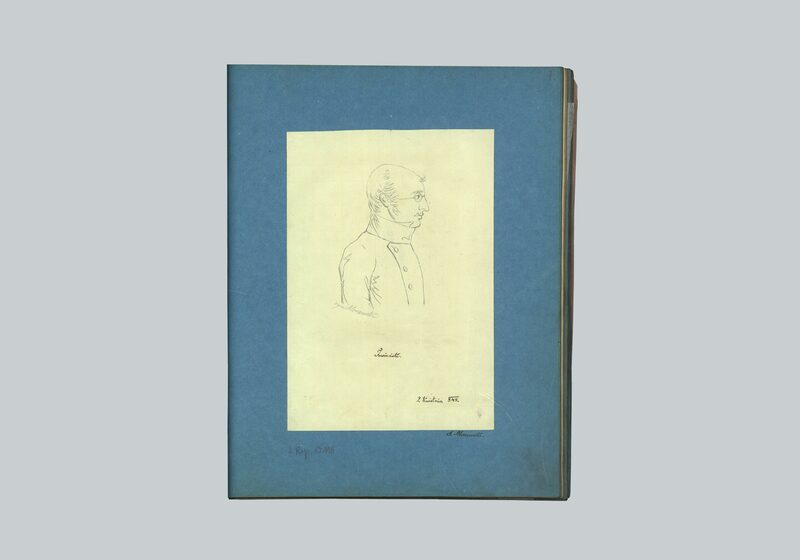 This was due to a noblemen from a village located near Vilnius, wearing round glasses with blue lenses, who suddenly appeared among the emigrant community in Paris. People long wondered how he managed to instantly win the poet over. Many believed it was caused by magnetic fluid or evil forces. It is certain that convincing the greatest of the Polish emigrants to support his cause was an indisputable success on the part of Andrzej Towiański. It soon turned out that it was not only Towiański’s cause – it was God’s Cause and people needed to gather around it. Towiański gave hierarchic structure to his God’s Circle: the Master, Brother Adam, and guardians heading groups of seven people – “sevens.” One’s position in the hierarchy depended on his power of spirit, which could only be assessed by the people at the top of the spiritual ladder. The Circle of God’s Cause, therefore, had Mickiewicz, had a religious system, writings explaining its doctrine, its own relics and rituals, even its particular language, since it was impossible to speak of the new programme of spiritual development without creating neologisms. Among the followers of Andrzej Towiański’s teachings there was Julisz Słowacki, who nonetheless quickly left the Circle. Słowacki joined the Circle of God’s Cause on 12 July 1842 and this event changed his life. Brother Juliusz felt comfortable not only among the members of the Circle, but also with the organisation’s religious doctrine and programme of spiritual revival. Nonetheless, he eventually broke his ties with Towiańczycy. Why? According to Towiański’s disciples, he was not humble enough. According to the people close to Mickiewicz, who constantly contrasted Słowacki with the author of Pan Tadeusz, he would not kneel before Brother Adam and recognise his leadership. Biographers claim that Słowacki was outraged – first at the predominance of formalities and conventions over the ideas of the Cicle, then at the Cicrle members praying for the soul of Emperor Nicholas I, and finally at the reconciliatory letter written by Towiański to the tsar with the aim of converting him to their religion. The important thing is that upon his break from the Circle, Słowacki had already started to undergo spiritual transformation, which soon afterwards – after the poet had left for Pornice – became the basis of his own concept of faith. This way, Słowacki disappeared from Towiański’s scope of influence. He returned to Paris in 1839. On 25 December 1840 he allegedly was defeated by Mickiewicz in a contest of poetic improvisation – which we would nowadays refer to as a freestyle battle – held during a dinner at the house of Eustachy Januszkiewicz, the famous and often discussed “December feast.” In June of the following year, there was a possibility of Słowacki disappearing literally and irreversibly – in a duel. 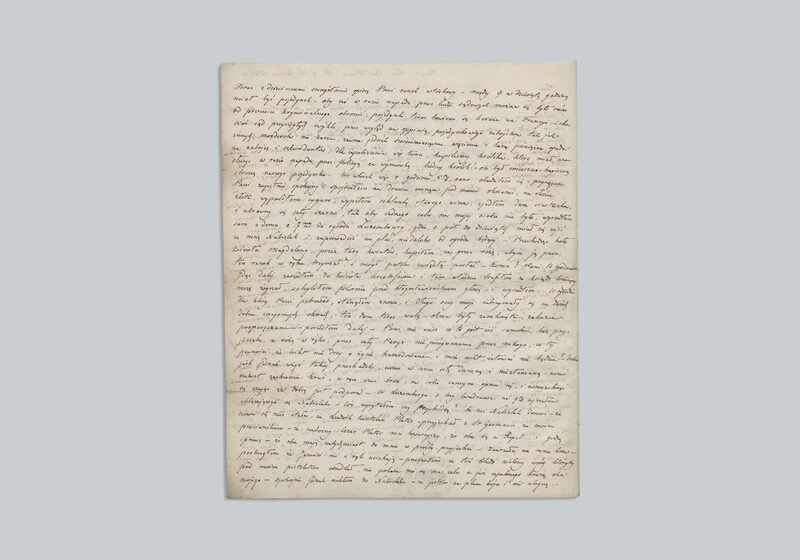 As he described it in a letter to Joanna Bobrowa, this was his “Don Quixote day,” during which he was to shoot and be shot at by Stanisław Ropelewski, whom he had offended in Beniowski and who had written an extremely negative review of Balladyna. The duel never took place. 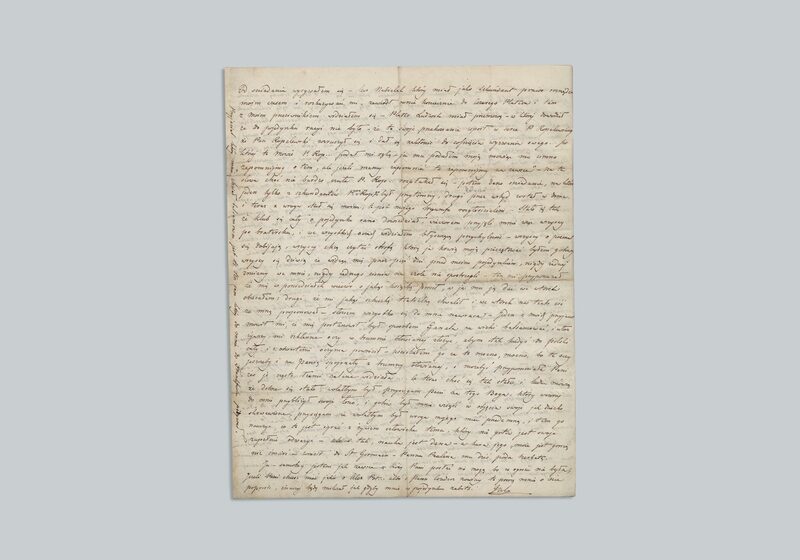 The letter describing Słowacki’s arrival to the duel site is preserved in the National Library in Warsaw, along with a letter written a year later to the same addressee, where he wrote: “I will disappear as if I have never existed.” He met Towiański two months later. Seeing that the priority of all emigrants was regaining independence and shaping the new Polish State, the most important discussions took place in political associations. 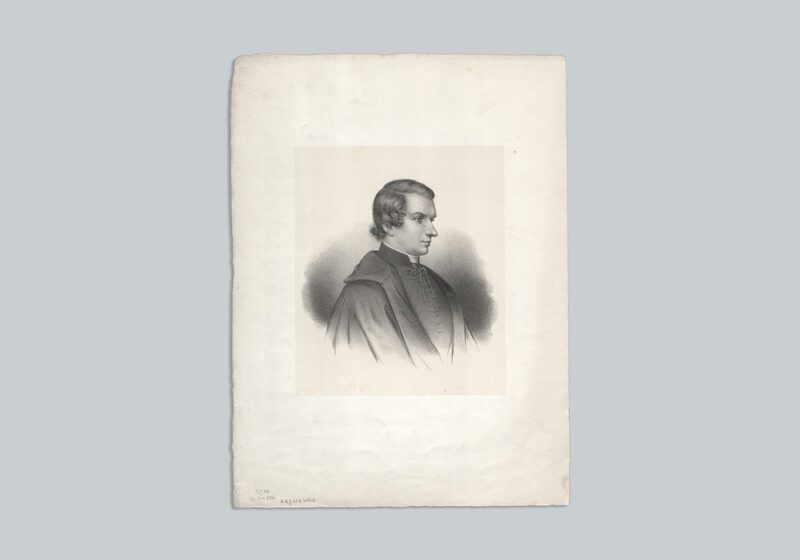 The main opponents in this field were conservatives gathered around Czartoryski and democrats led by Joachim Lelewel, who later went on to establish the Polish Democratic Society, gaining more and more influence in the emigrant communities in Paris and other localities from the 1840s. 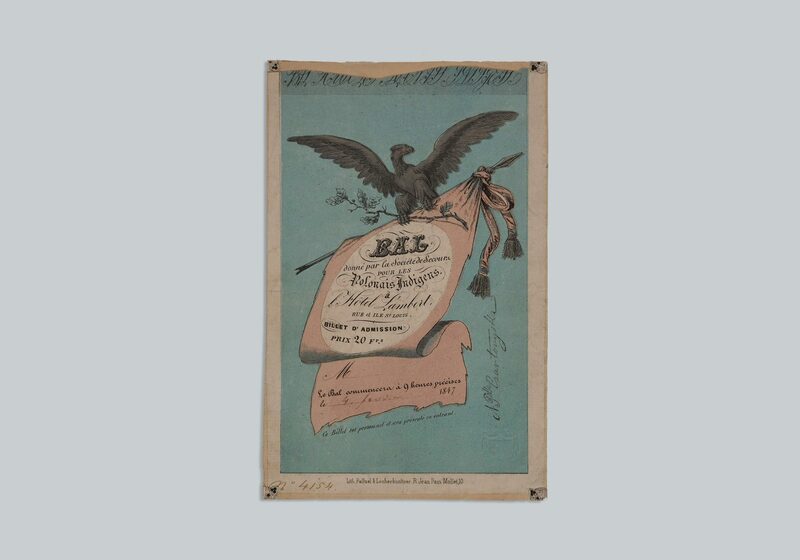 Political factions published their own newspapers, which served as soapboxes for their views. There were manifold magazines issued in Paris at the time. 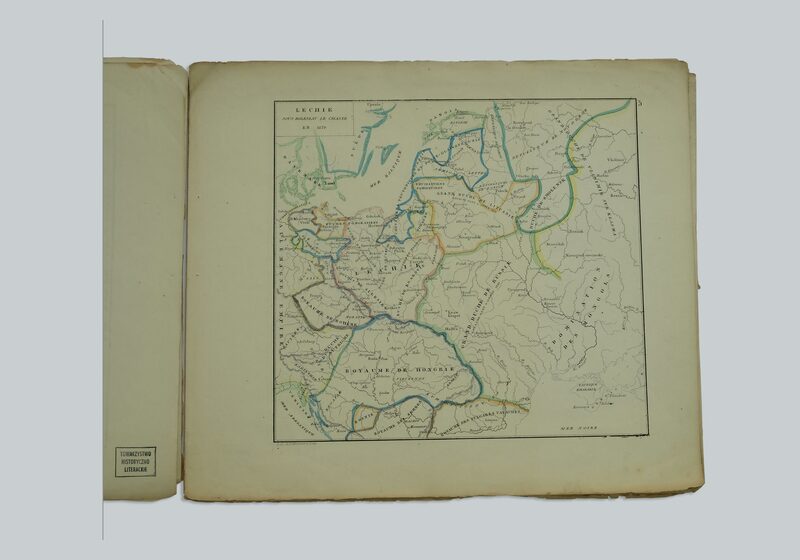 The views of the Polish Democratic Society were expressed in the paper called Pszonka, published in the years 1839-1844, which according to the declarations of its editorial office could be issued between two and even a thousand times a year. Press was also one of the factors attracting readers to the Polish Club, as the Polish Society was referred to. Only men could join the Club, which was based on English societies. The membership fees were paid upfront. In return, the Club offered a place to seat, people to talk to, dinner at a good price, newspapers to read, and pool or cards to play. The regulations of the Club prohibited gambling, excessive alcohol consumption and… discussing politics. One of the most significant associations working in exile was the Literary Society, established by supporters of Adam Czartoryski, who served as the organisation’s chairman. 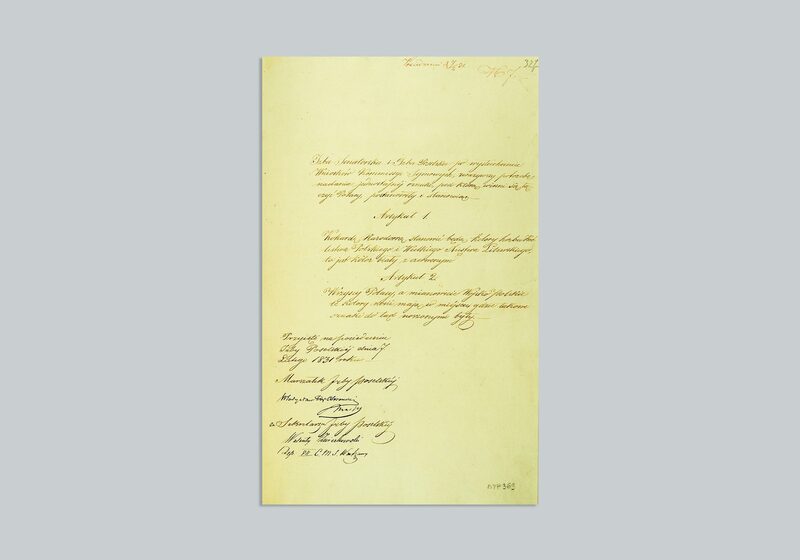 Among its members there were some of the biggest figures of the Emigration – for instance Bem, Niemcewicz, Mickiewicz, Chopin, as well as Słowacki, who, as indicated by meeting minutes, was often absent from the society’s assemblies. The organisation, while “literary” in name, focused primarily on collecting, developing, and publishing historical materials concerning the Kingdom of Poland and, importantly, fell in line with Czartoryski’s policy through sparking interest in the Polish cause among Frenchmen and other Europeans. The society constantly expanded and transformed. Eventually, a separate historical branch emerged, but in 1854 it once again merged with its mother organisation to form the Literary and Historical Society (renamed Historical and Literary Society in 1866). The Polish Library, which initially stored collections of the Literary Society and the Society for Academic Aid, served as a counterbalance to Nicholas I’s attempts to annihilate the Polish culture. In the process of Depolonisation, Polish libraries were liquidated and dismantled, while their most valuable resources were sent out to Russia. The collection of the Polish Library quickly expanded – some of the people who handed over their private collections to the organisation were Niemcewicz and Bem. 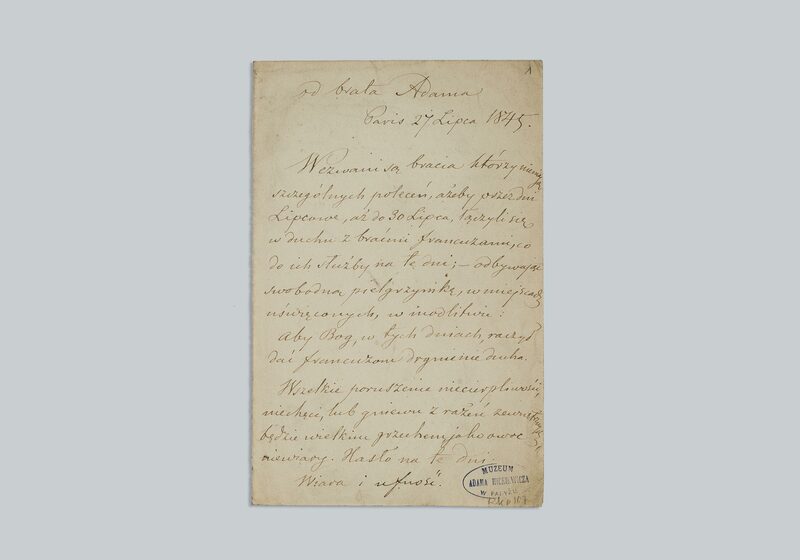 The Adam Mickiewicz Museum was established by the Library in 1903; its collection was composed of manuscripts, keepsakes, and other materials connected with the artistic output of the author of Dziady and Pan Tadeusz, all donated to the institution by Władysław Mickiewicz. Nowadays, the book collection of the library consists of 200,000 volumes, including ca. 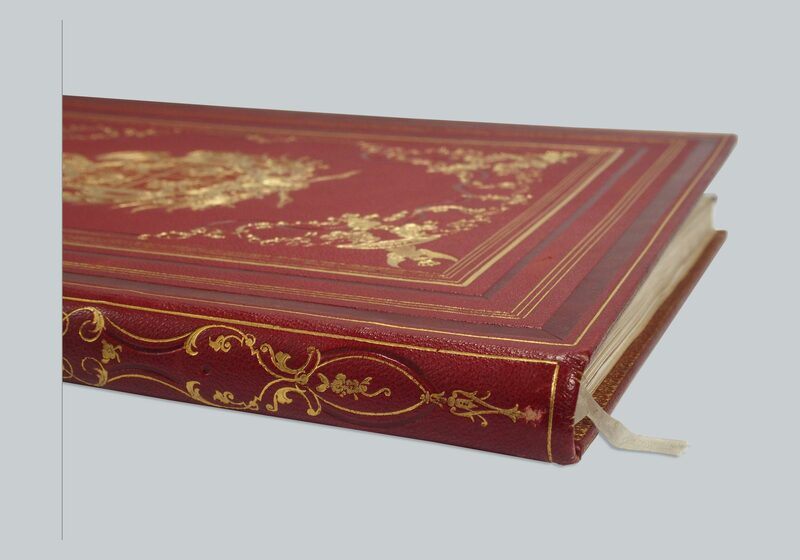 50 incunables, that is materials printed before 1500, and several thousand old prints. 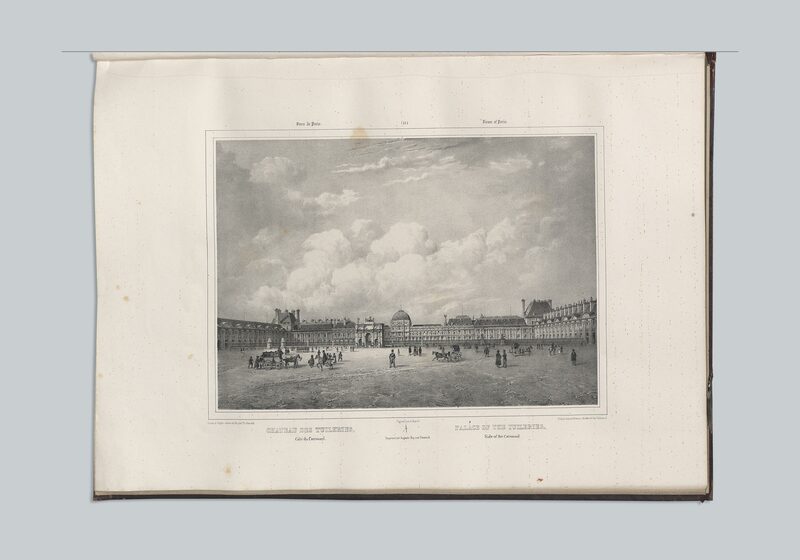 The institution’s archive stores over 8,000 manuscripts, while its artistic resources consist of 25,000 drawings and prints, 15,000 photographs, almost 1,500 paintings, 1,000 posters, 600 medallions and coins, 350 sculptures. 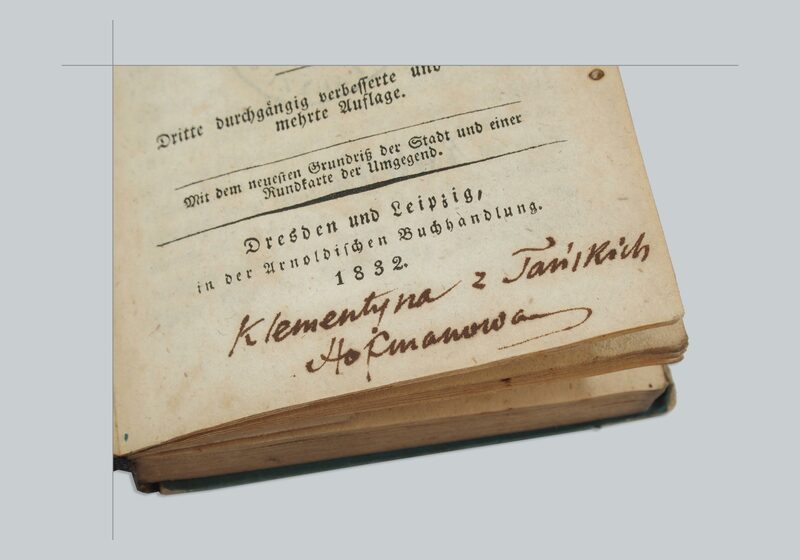 One of the most valuable belongings of the Library are the first edition of Mikołaj Kopernik’s groundbreaking work, fragments of correspondence of Queen Bona Sforza, items previously owned by Frédéric Chopin and Maria Skłodowska-Curie, friendship books and jewellery of Maria Szymanowska, and a monumental archive of the Emigration, containing such items as the fragments of manuscript of Dziady, the documentation of societies and institutions working in exile, diaries, or letters. Apart from the Mickiewicz Museum, the building also houses the Bolesław Biegas Museum and Chopin’s Salon. Access to the library’s collection is granted in two reading rooms. The walls of the house at Quai d’Orlèans preserve the memory of the Library’s difficult wartime history and of the times of the Communist regime. Over almost 200 years of its operation, the methods and bodies governing the institution have undergone numerous changes, while its unstable financial status has often hampered its dynamic work. Nonetheless, the Polish Library in Paris invariably constitutes one of the most important (and most beautiful) links between the Polish culture in the country and in exile. The November Uprising was a generational experience for the peers of Mickiewicz as well as those born of the later Słowacki and Krasiński generations. 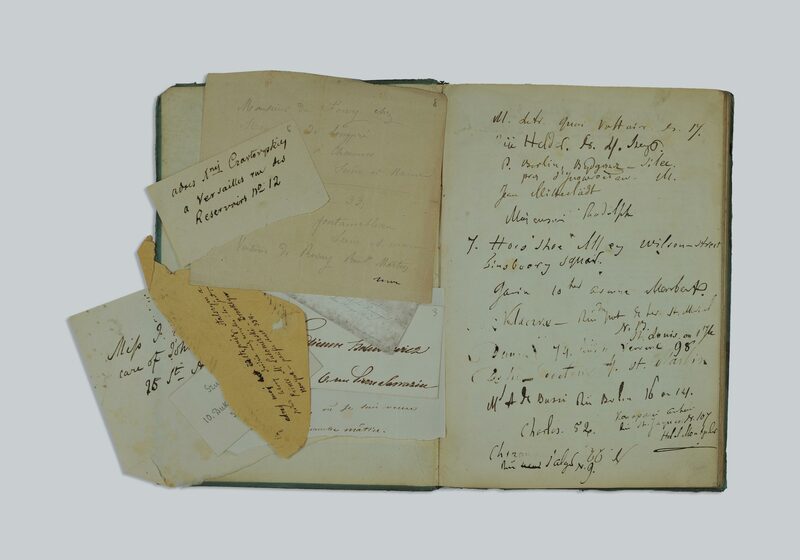 The campaign course – from the initiating assault on Belvedere by a group of young officers – as well as the fate of both the uprising and the poet, in unfair struggle, defeat and exile, became one of the models of the romantic biography. 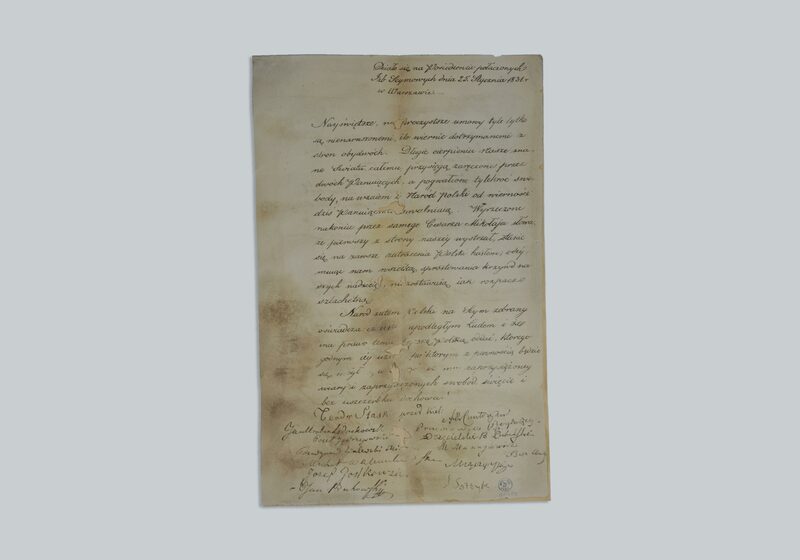 The document issued by the Parliament of the Polish Kingdom and bearing 188 signatures was hunted for many years by the Tzar’s police. The act was smuggled out of Warsaw to Prussia then hidden for 30 years at St. Mark’s church in Göttingen. 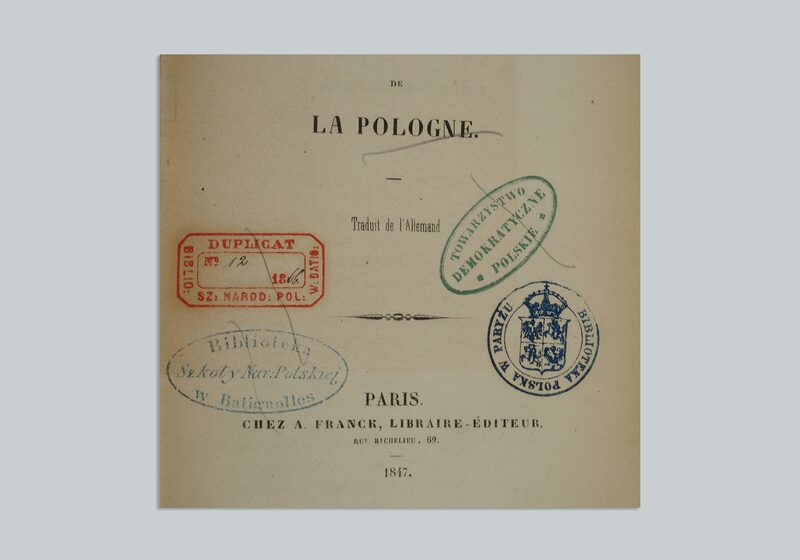 The Polish Library in Paris aquired it in 1876. 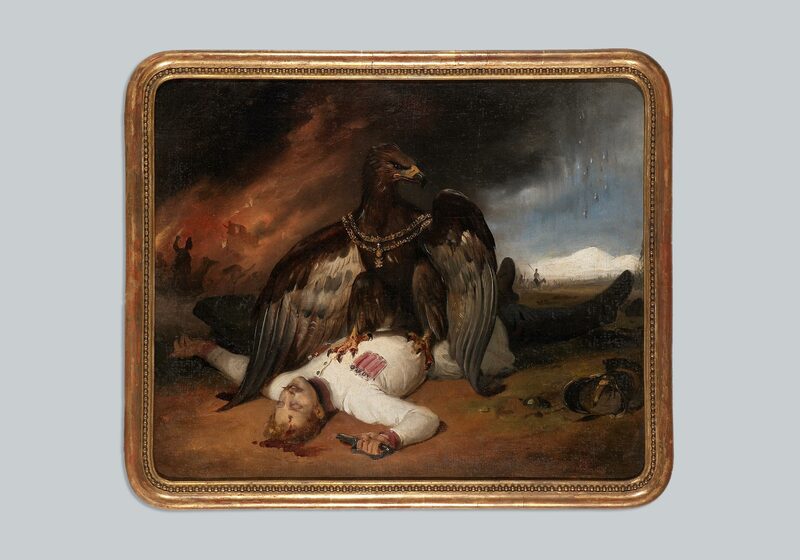 Vernet likely found out about the events of the November Uprising from escapees who emigrated to Rome. Ten years later he will paint for Tzar Nicholas I a different vision of the uprising – “The Taking of Warsaw in September 1831”. 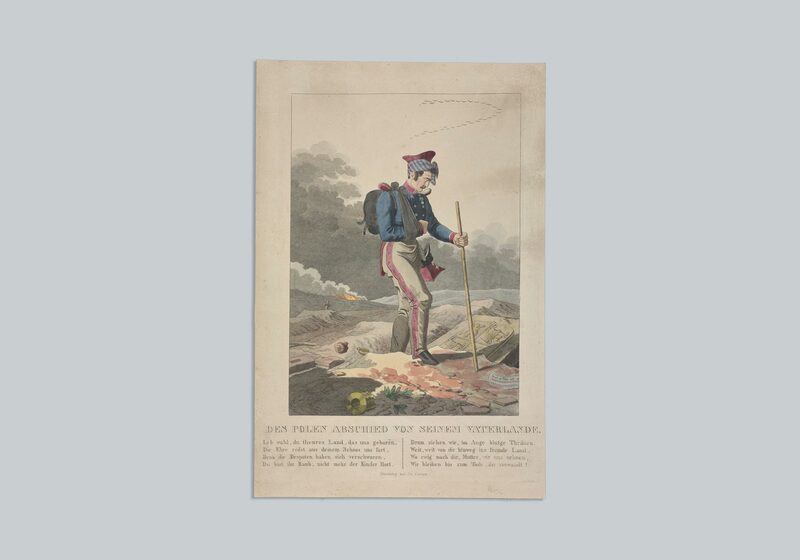 This anonymous illustration seen shortly after the uprising portrays a soldier from the defeated army as an exile who – literally – treading on the remains of the nation moves towards emigration. 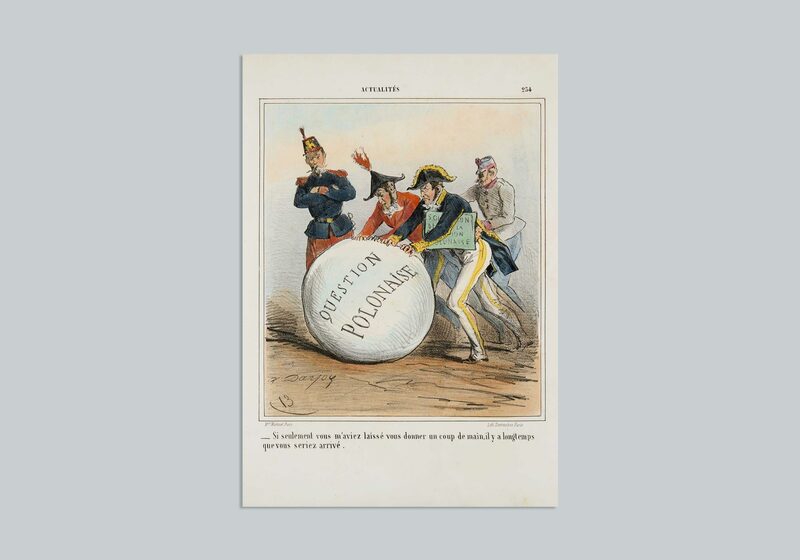 “If only you would have allowed me to help you, you would have succeeded long ago” – the satirical French illustration shows the situation of Poland among the great European powers. 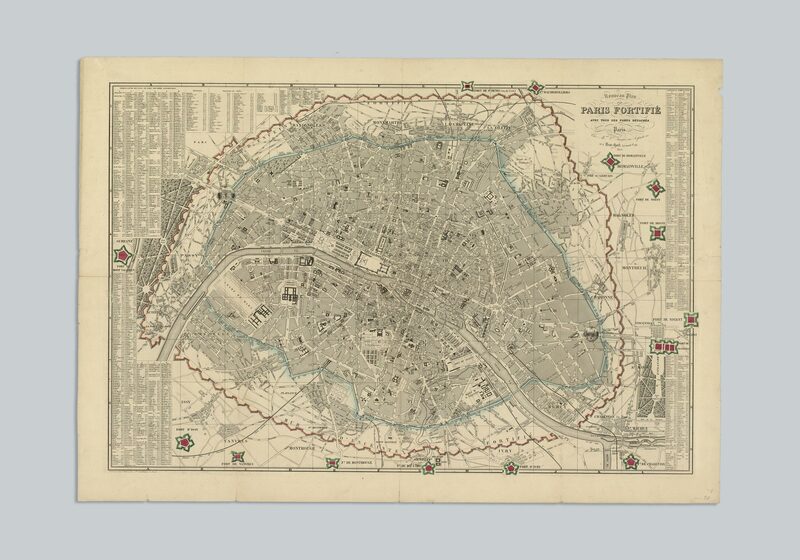 Paris on the brink of Baron Haussmann’s reconstruction. The architectural system would accommodate the needs of a modernized society. During this very period the city’s population first exceeded one million inhabitants. 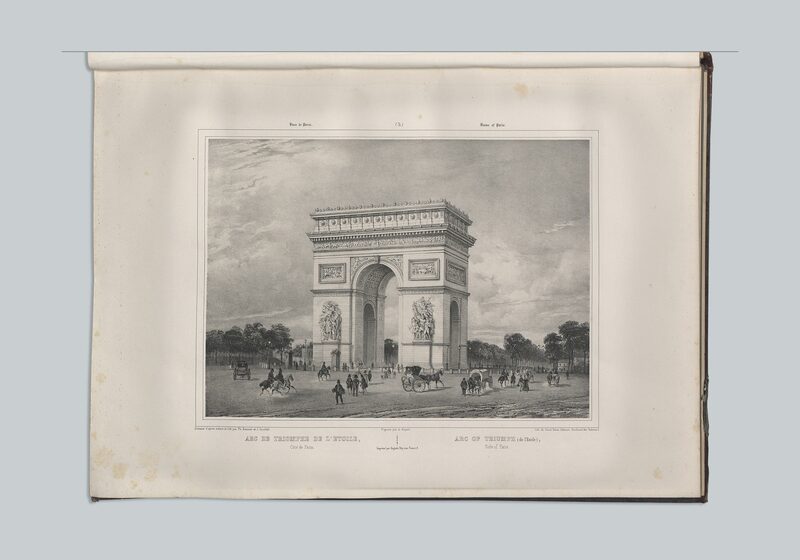 The Arc de Triomphe, exceeding 50 meters in height, is a memorial for France’s fallen soldiers. Among the names of 386 officers of Napoleon’s army etched on the monument are included 7 Polish names. On the inscription dedicated to places of battle there are 5 Polish cities listed. The building of St. Magdalene’s church took nearly 90 years. France’s fluctuating political climate caused politicians to come up with constantly changing ideas for the completion of the strucutre. In 1806 Napoleon ruled that the church ought to be designated as a sanctuary of the French army, so all of the existing elements were demolished and the work was begun anew. The church was finally consecrated in 1842. Frederic Chopin’s funeral mass was held at La Madeleine. The palace at Tuileres was nearly completely destroyed during the rule of the Paris Commune. Today, from the spot seen in the photograph, there opens up a view of the park. 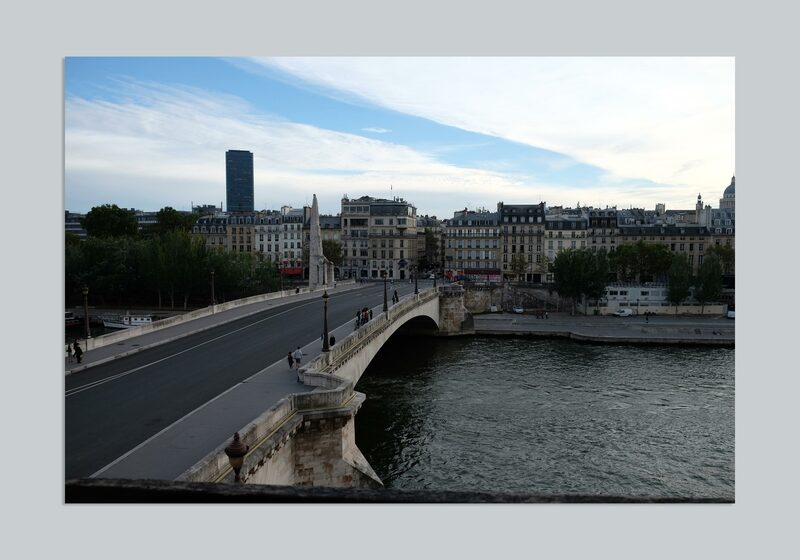 It is a favoured walking space for Parisians and tourists alike. Besides his political activism Adam Jerzy Czartoryski was also a writer. His most well known work “Bard polski” (The Polish Bard) was written after the failure of the Kosciuszko uprising. The Hôtel Lambert is still under renovation to this day. In 1975 Guy de Rothschild purchased the building from the Czartoryski family later selling it in 2007 to the brother of the Qatar’s sheik Abdullah bin Hamad bin Khalifa Al Than. A large renovation was planned, however only some of the proposed changes were agreed upon by the French minister of culture. In the summer of 2013 the building was partially burnt down. 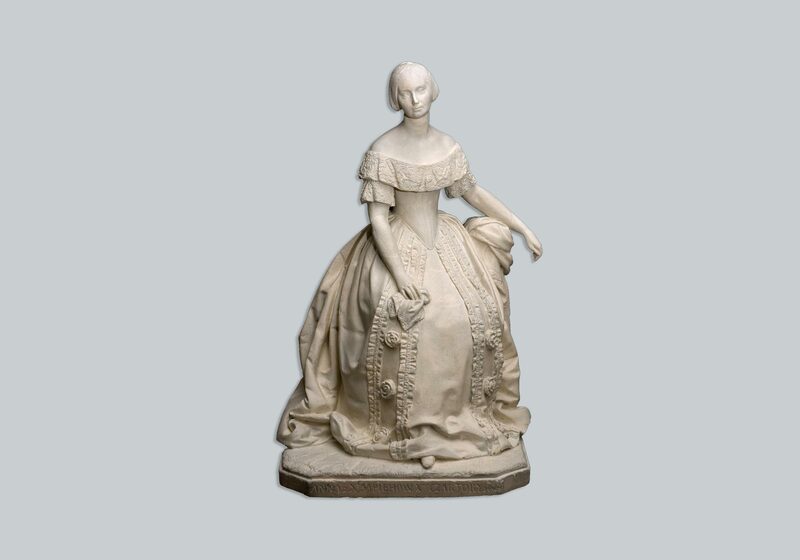 The Czartoryski family also collected funds for their charitable works by organizing balls and bazaars. The entrance fee for the February 4, 1847 ball was 20 francs, nearly 5 times the wage given to low ranking soldiers of the revolutionary army. 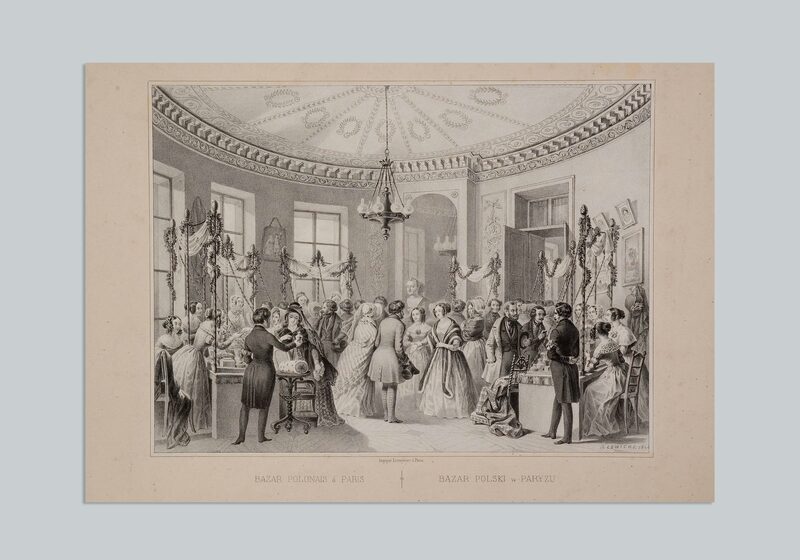 This illustration of a scene at a ball organized by princess Czartoryska on January 25, 1845 demonstrates the huge popularity of this type of event. 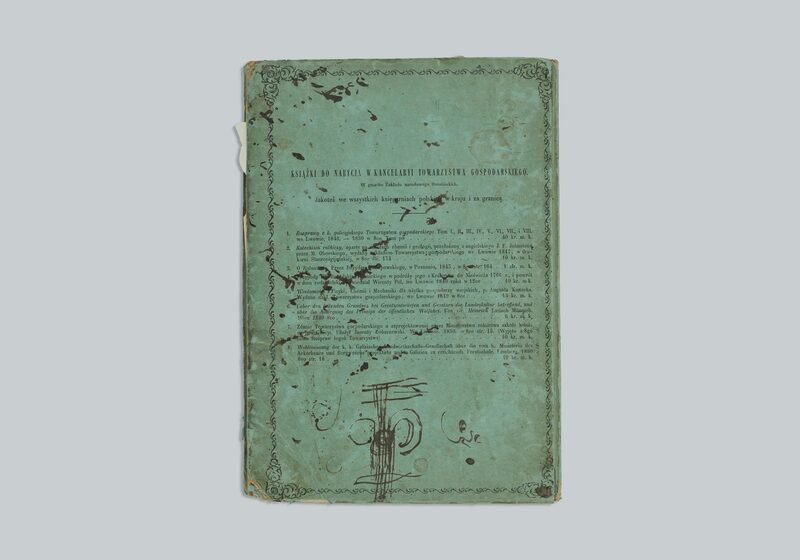 In 1851 Mickiewicz recorded addresses in a Liwoczanin agricultural calendar, alongside which he also included notes on spare sheets of paper and envelopes. Among the tens of addresses belonging to Polish immigrants one can also find the Versailles address of princess Czartoryska. The calendar’s cover and interior pages also served as a place to test out the quill. Following the fall of the uprising active participant Klaudyna Potocka ended up in France. She settled in Geneva, from where she ran a wide range of charitable operations – setting up a hospice in her own home. 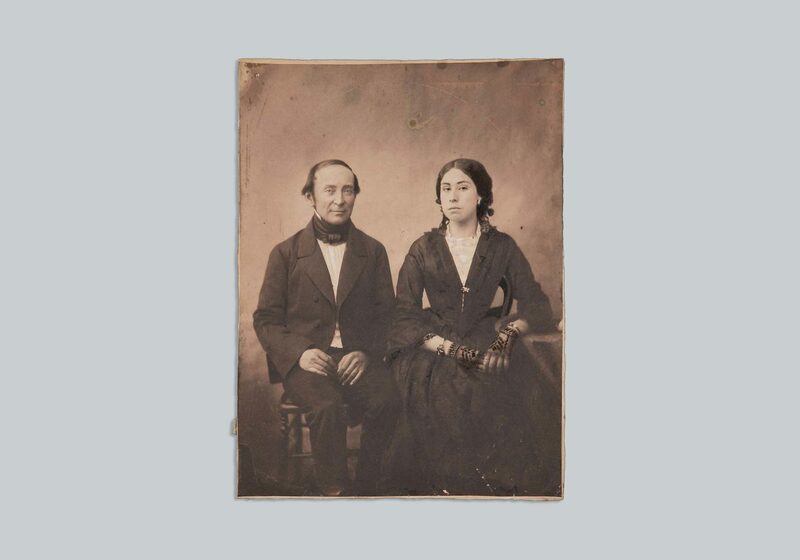 She found herself in Paris in the 1830s where she met the Czartoryskis and became interested in charitable organizations that had been set up to aid immigrants. After the death of prince Adam Jerzy Czartoryski his youngest son Władysław took over his responsibilities leading emigration efforts. 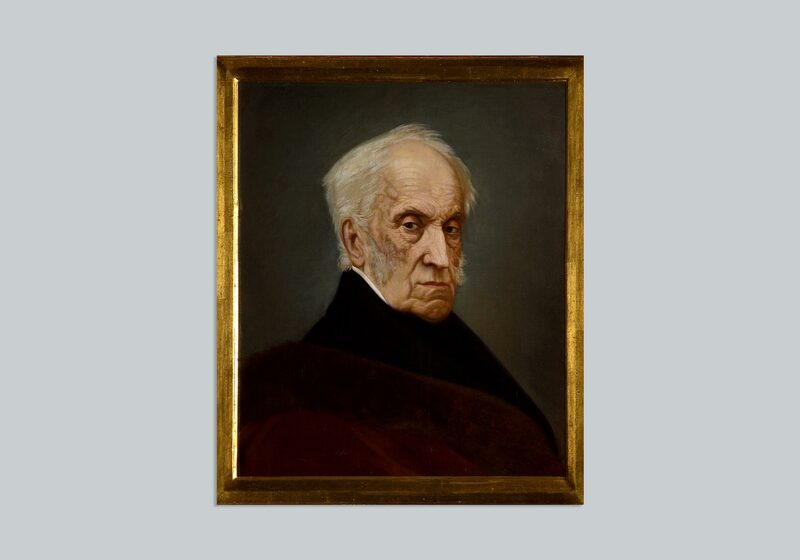 He was the president of the Historical-Literary Society and founder of the Czartoryski’s museum in Krakow. Witold, the eldest, withdrew from politics. Adam Jerzy Czartoryski died in Montfermeil, near Paris. He was 91. The prince’s funeral procession commenced at the Hôtel Lambert. The ceremony took place at St. Louis’s church. He was buried at Montmorency, from where his remains were moved to a family crypt in Sieniawa four years later. 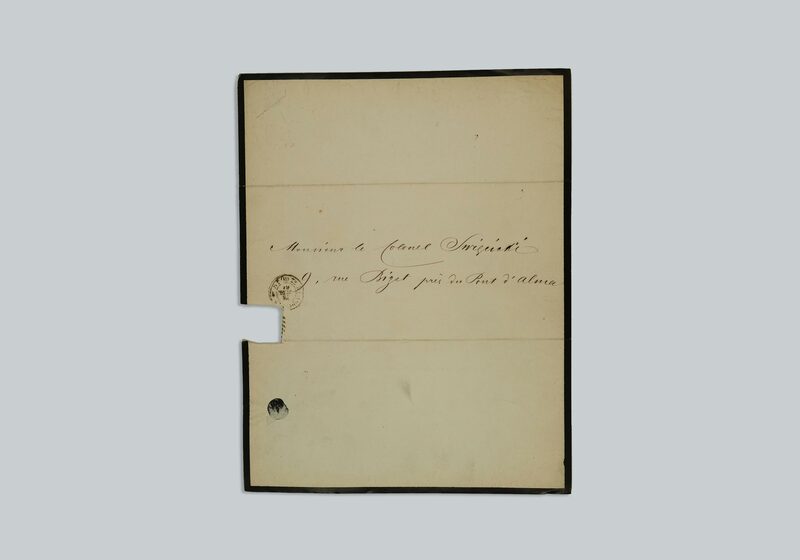 Envelopes were rarely used in the XIX century by modern standards. Obituaries were sent to mourners folded into four, the address and postage stamp applied directly to the paper. The square cutout seen in the paper was caused by someone cutting out the postage stamp which had been glued onto it. Princess Czartoryska impressed Juliusz Słowacki as hostess of the Hôtel Lambert during his first visit on February 20, 1832. The Polish bazaar, or charitable raffle (fair) was a good method of fundraising. Tickets were sold especially for the cause. Playwright and poet Tomasz August Olizarowski was Norwid’s closest friend. After falling ill he landed in the Hospice of St. Kazimierz and thirteen years later Norwid would join him. The Institute of Polish Maidens had its headquarters in one of the wings of the Hôtel Lambert. An additional building near the quai d’Anjou was purchased to accommodate the needs of the institute. 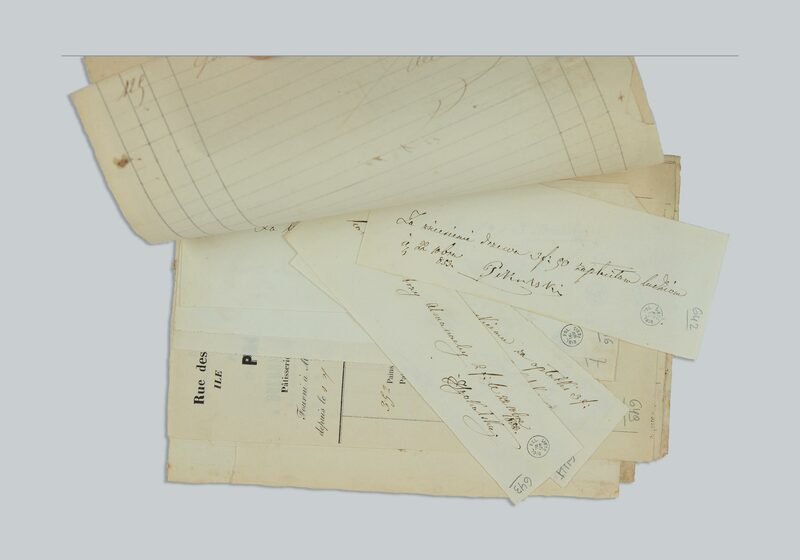 A monthly report of expenses shows the interim needs of the Institute. 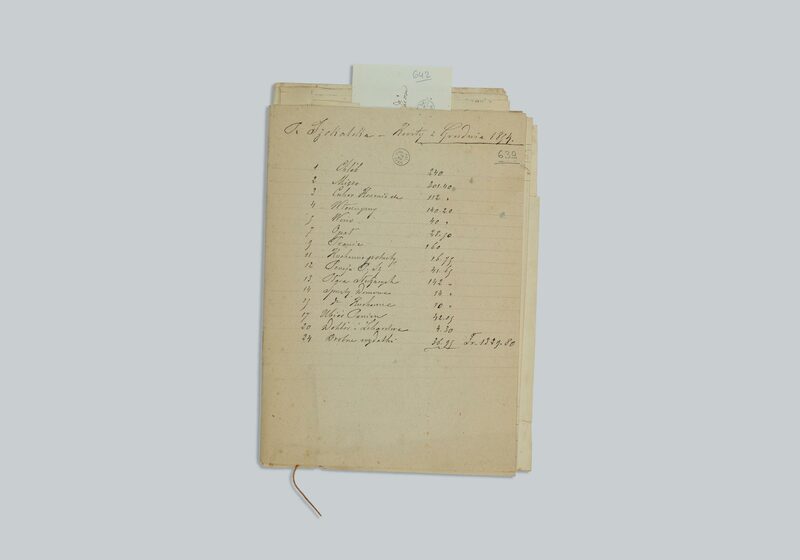 Bills for services and purchases – for example almanacs and wafers – were added to the monthly settlements. Madame Hoffman was surely well known and read within the Institute. 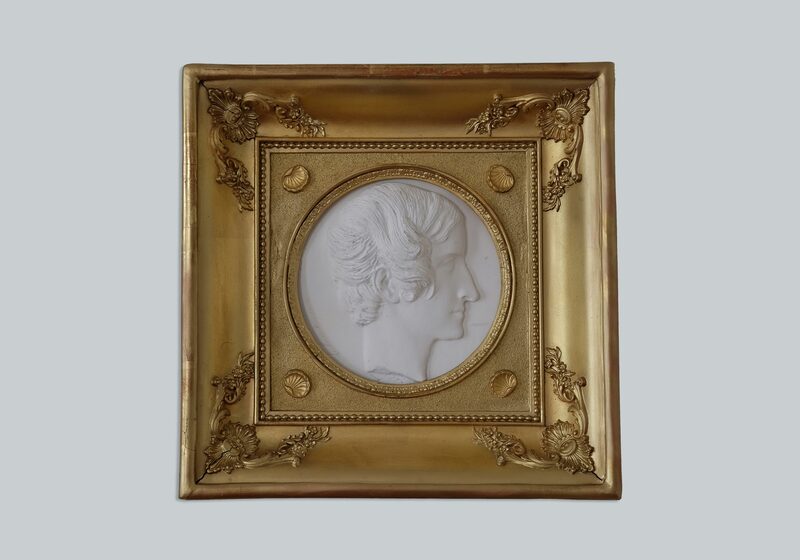 Her “Memento of a Good Mother” was recommended for use in girl’s institutes by the Government Commission on Public and Religious Education in 1823. 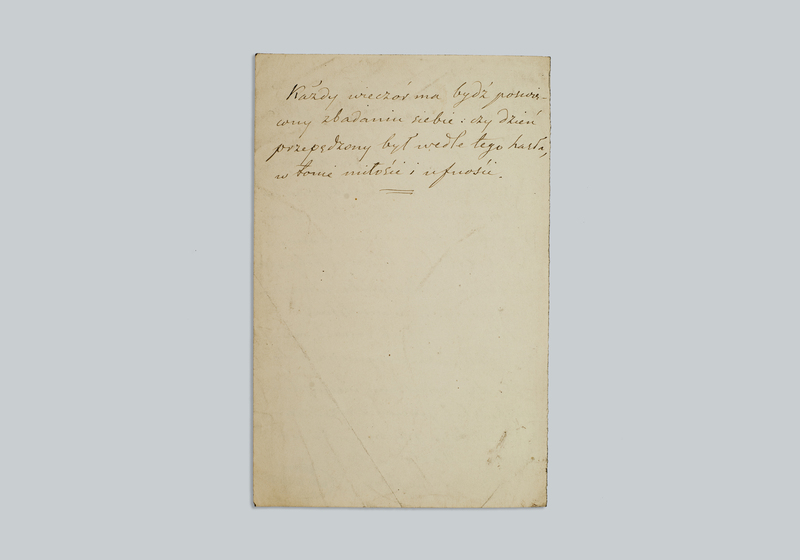 The Institute of Polish Maidens left much documentation of its workings. 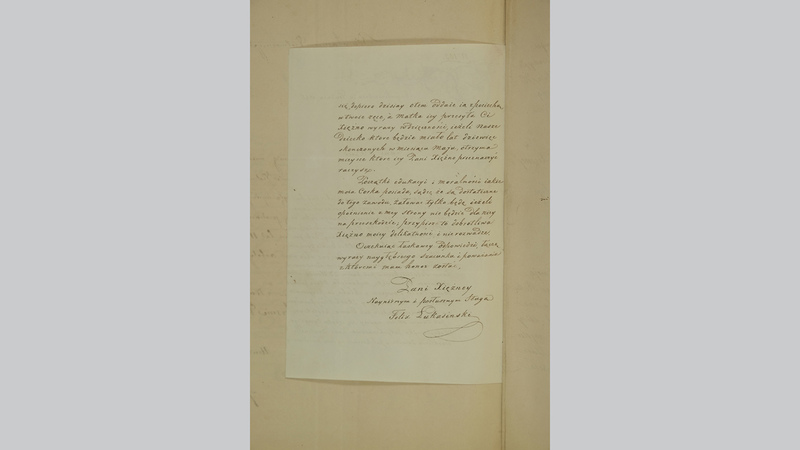 Some of the most interesting of these are requests for admittance to the school addressed directly to princess Anna Czartoryska. A parent had to present certificate of material difficulty signed by the mayor of their town. Guardians also had to provide a baptismal certificate, a note of good health, and proof of smallpox vaccination. Girls accepted for scholarships studied standard school subjects as well as topics such as art history. 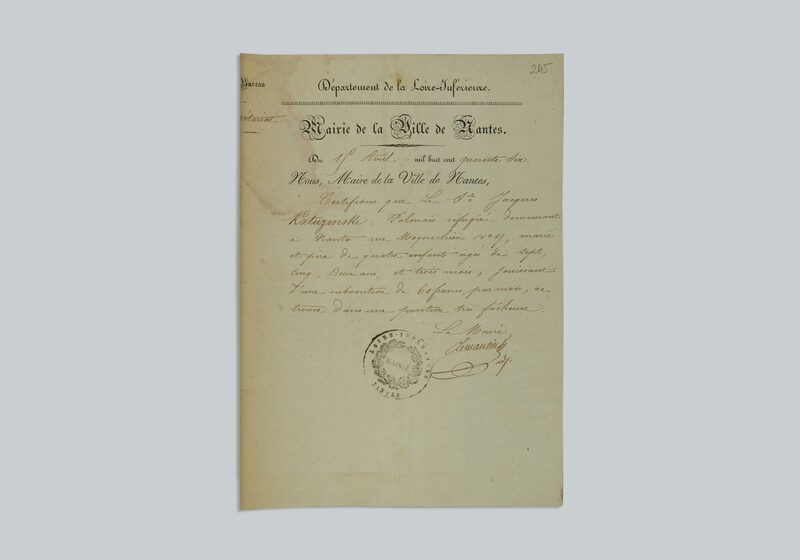 Physical education was conducted according to Parisian standards. Girls also frequented the swimming pool. The headmistress was in charge of governing daily activities and ensuring good behaviour. She was also responsible for the students hygiene for whom the school organized baths. The school primarily prepared girls to become professional teachers. Besides French, English and Italian were also taught. 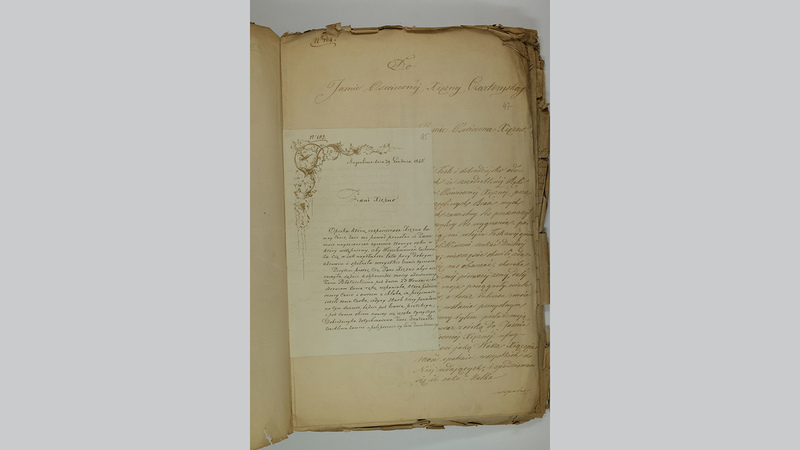 The first report of the operations of the Society for Academic Aid was sent out to donors in February 1834. Domeyko began his great academic career at Coquimbo college in Chile. He subsequently moved to the University of Chile in Santiago where he was the rector for sixteen years. The fifty year old Domeyko married Enriquette de Sotomayor when she was only 15 years old, however the marriage only lasted four months. Ignacy outlived Henrietta by 19 years. Besides his cartographic work Leonard Chodźko was also a political activist. 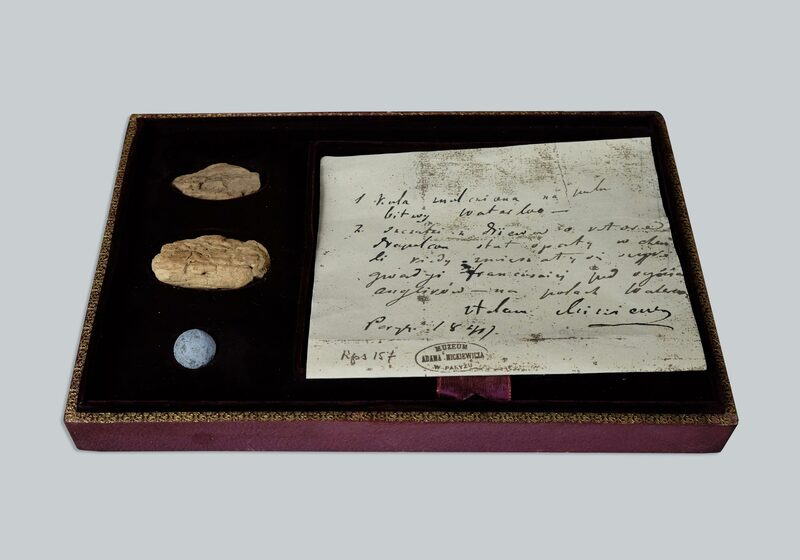 He also collected historical documents which made their way into the collection of the Polish Museum at Rapperswil. 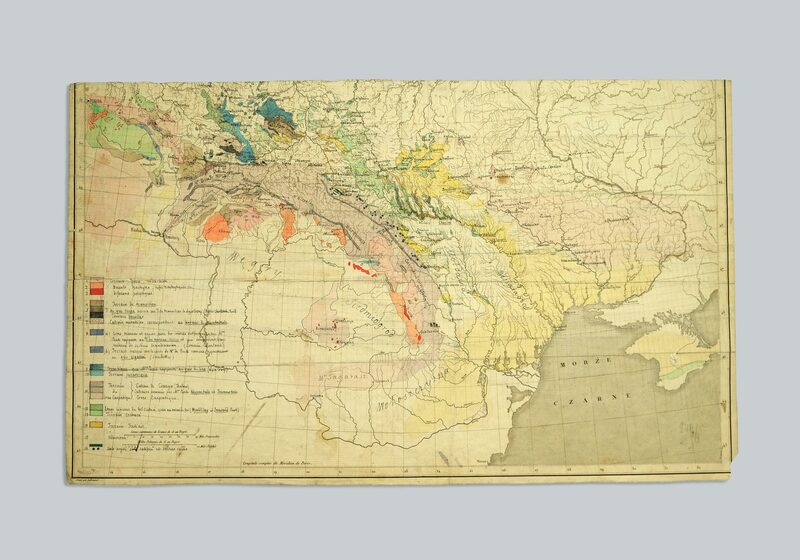 Domeyko was particularly interested in geology and mineralogy. “Domeykit”, an element which he first documented was named after its discoverer. Domeyko made use of time off from work for expeditions into the country. He spent much time in the Andes, which he studied on the occasion. 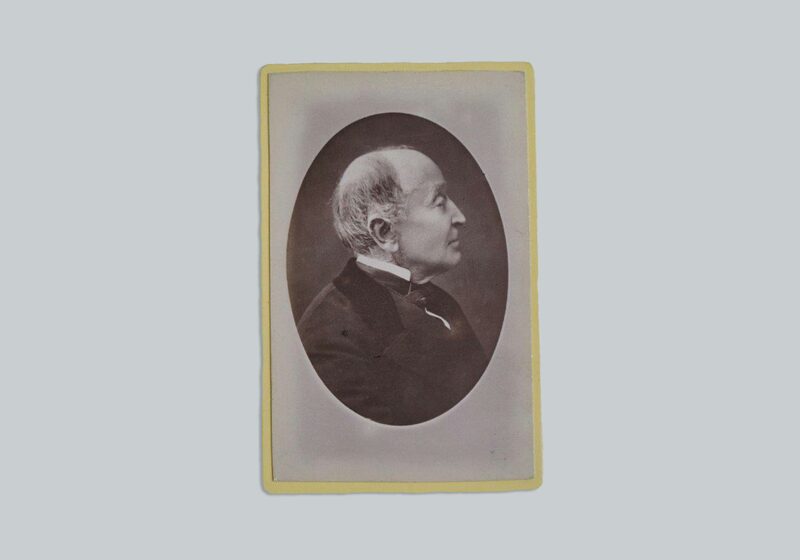 Joachim Lelewel was one of the most prominent persons in the emigration society and the animator of its cultural and political life. Lelewel was one of the most broadly talented representatives of the Great Emigration. His combination of artistic skill and historical knowledge was useful for many practical tasks including the cultivation of cartography. 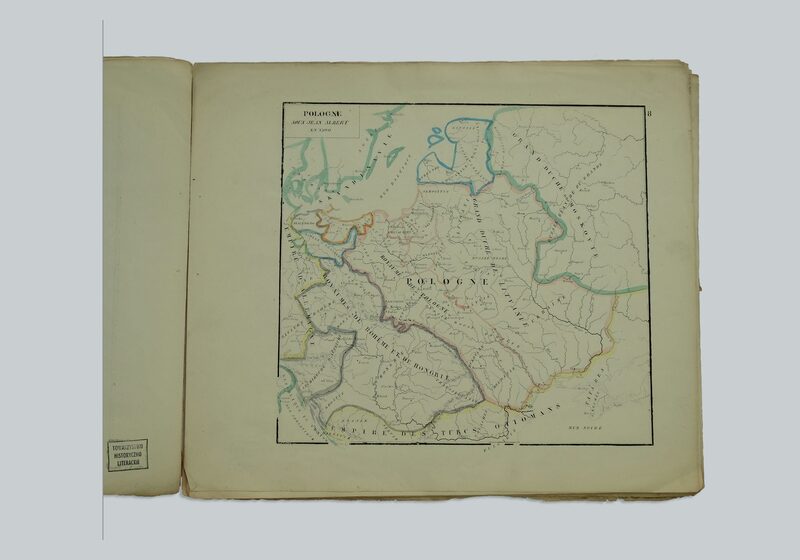 Lelewel’s Polish historical atlas contained 12 lithographed maps which illustrated the Polish territory throughout history. 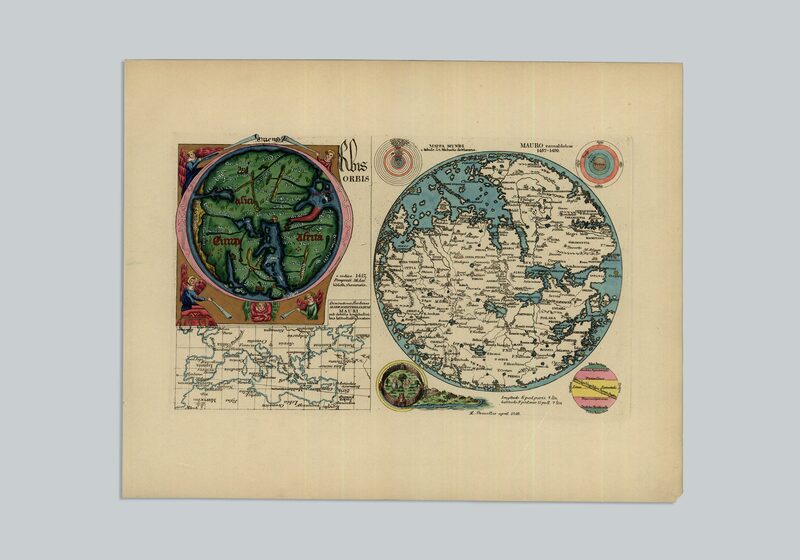 Joachim Lelewel also transcribed and produced historical maps of the Middle Ages. Another of his fields of interests was numismatics; the collection of coins, banknotes, and medals. Julian Ursyn Niemcewicz was called the father of the Great Emigration. 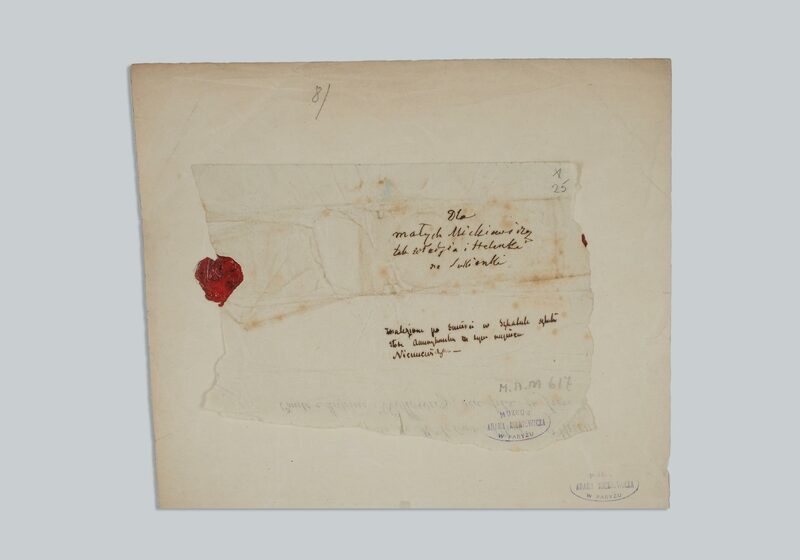 A paper envelope found in the documents of Adam Mickiewicz shows that he cared for the youngest emigrants like a… grandfather. The death of Niemcewicz was an important event for Polish emigrants. 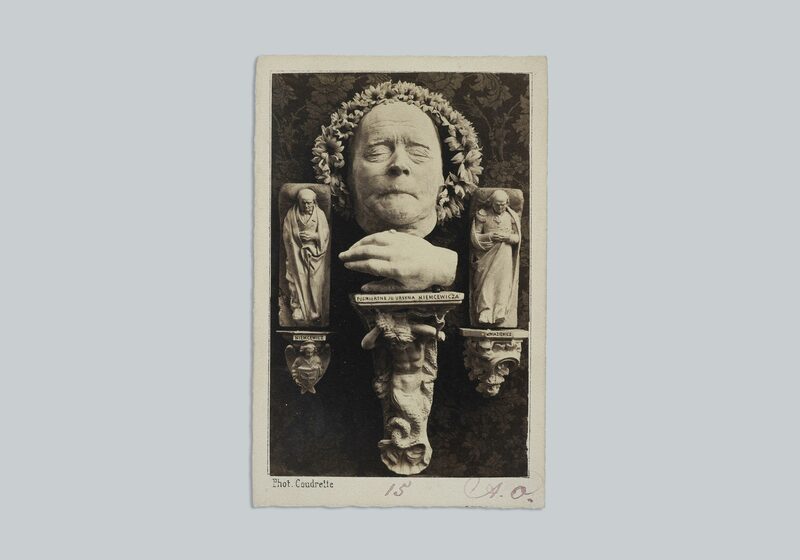 In accordance with tradition a death mask was made of the poet’s face – as with other important figures of the age. Beside it we see miniatures of the tombstones of Niemcewicz and Kniaziewicz. A portrait of Bogdan Jański presented to Paweł Popiel in 1849 by Hieronim Kajsiewicz. Franz Mesmer’s “animal magnetism” became fashionable and popular in the XIX century. 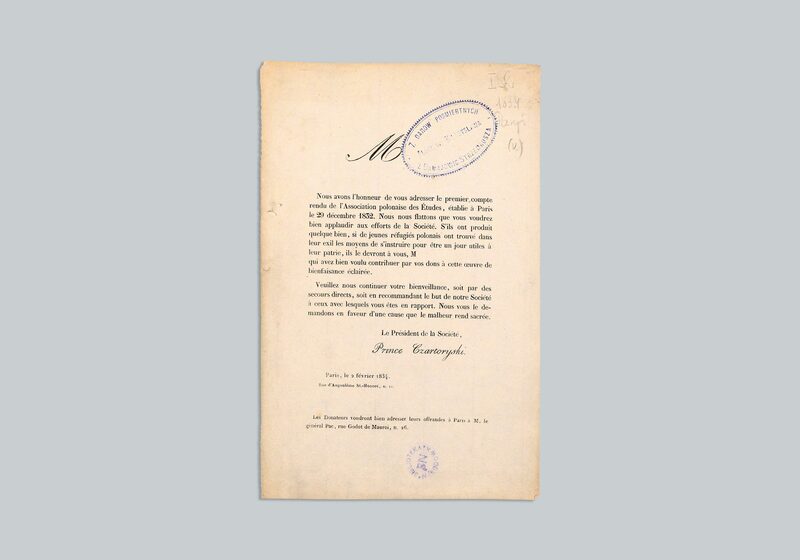 The fact that Semenenko distributed a pamphlet condemning animal magnetism shows an interest among Polish emigrants. 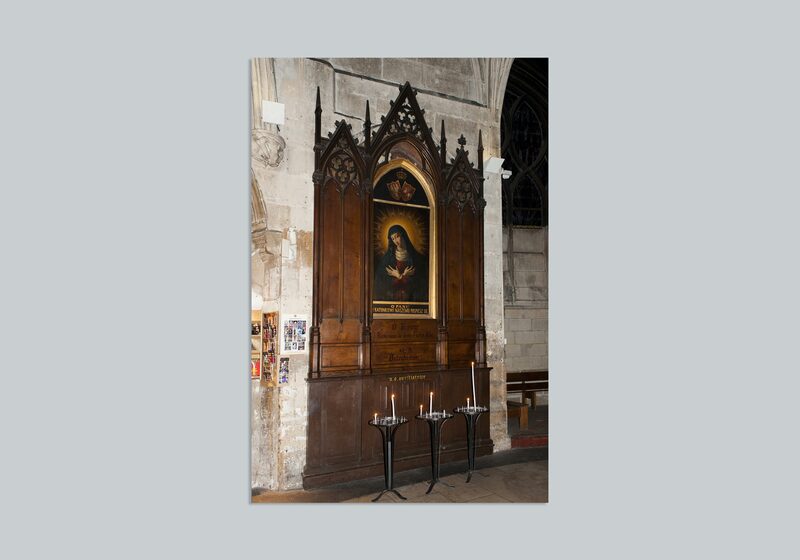 In December 1841 Towianski hung a copy of the image in St. Severin church which was 5 minutes away from Notre Dame. The replica was painted in 1834 by Walenty Wańkowicz. Towianski especially revered Napoleon. His “relics” are among the many which the Towianski’s Circle collected. After Towianski left, Mickiewicz took over as leader of the Circle. 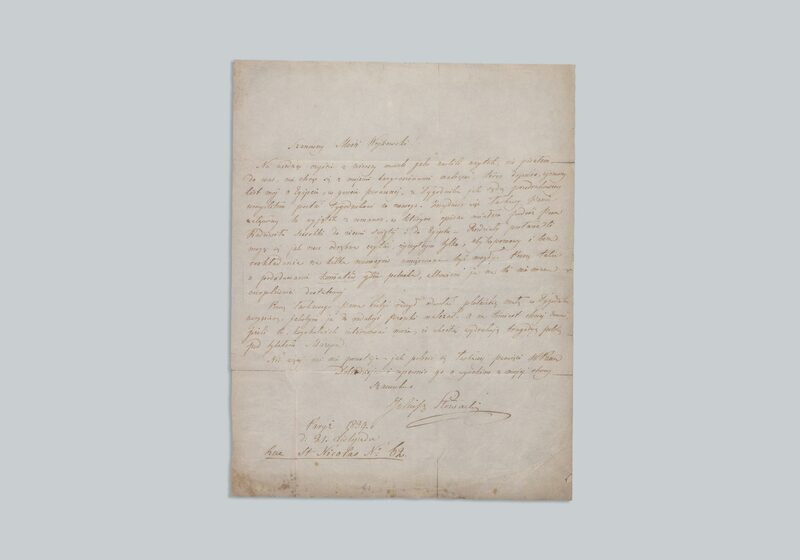 In the last days of July 1845 he instructed his congregational brothers and sisters “who did not have a special vocation” to join spiritually with their “Franciscan brothers” . 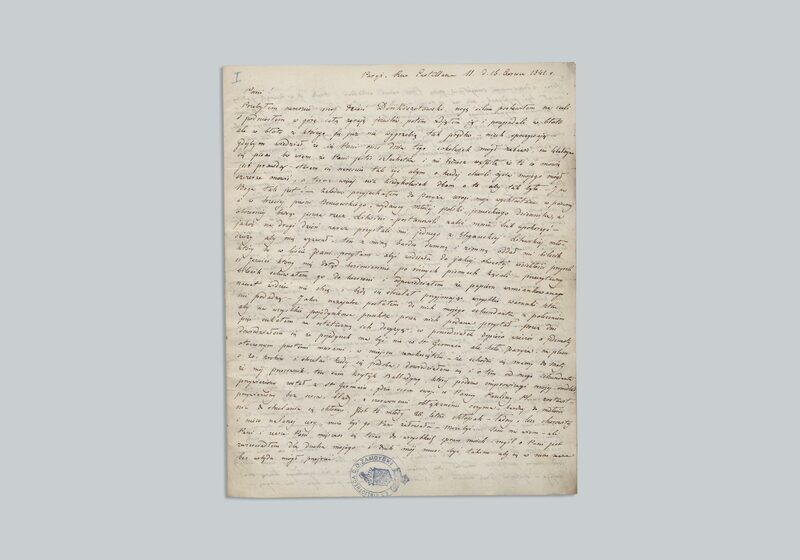 Appeals for faith, love and trust are stated repeatedly in a letter to the “Brother Adam”. 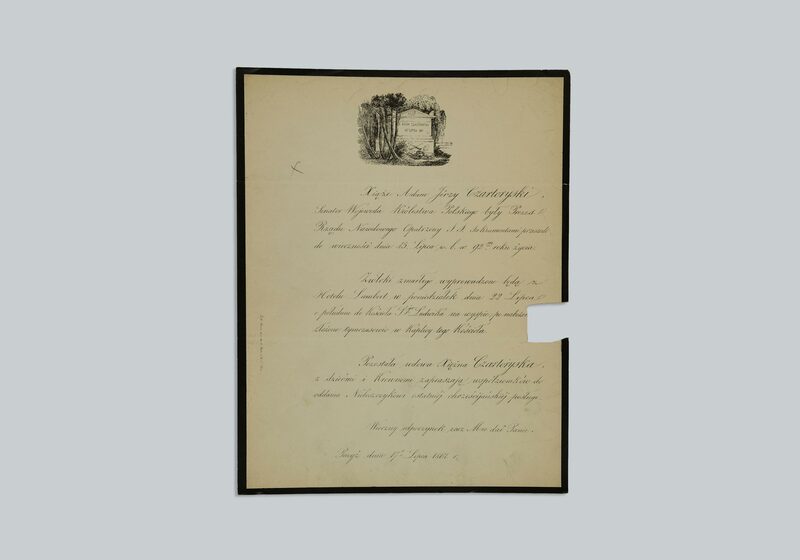 In a letter to Mrs. Bobrowa Słowacki writes with “childlike detail” of his morning duel with Ropelewski. The duel was organized in the form of a rabbit hunt (which had been purchased just for the event). The poet’s path from home near Rue Castellane to the Luxembourg gardens led past place de la Madelaine (the place where Słowacki bought the rose) as well as the church of Notre Dame de l’Assomption. The dispute, despite the poet’s resistance, was resolved. Słowacki begrudgingly accompanied his runner up to breakfast to Cezary Plater’s place, where the opponents reconciled. 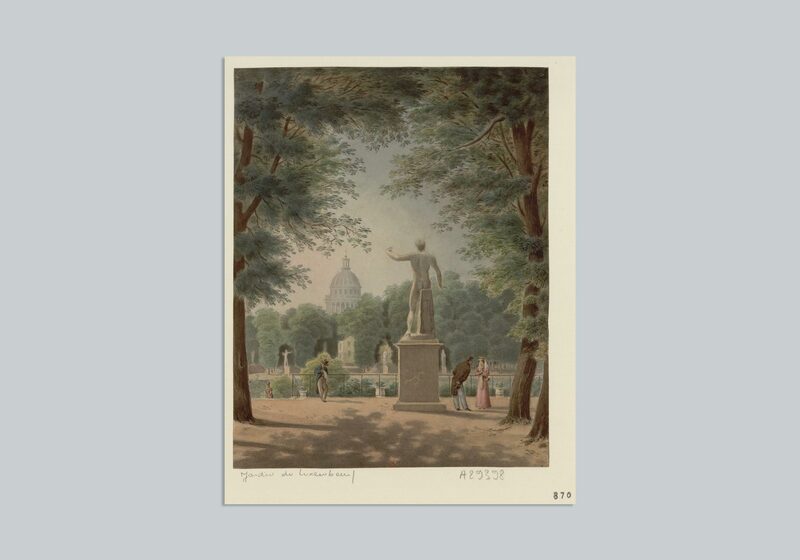 The Luxembourg garden at the 1840s. Stanisław Pszonka was a nobleman who lived in the 16th century and founded the Babin Republic (Polish: Rzeczpospolita Babińska). His portrait was featured on the “Pszonka” satiric journal’s vignette and on the title page of “Album Pszonki”. Juliusz Słowacki had a sharp tongue. Therefore he asked the editor of “Tygodnik Literacki” in a letter written in 1839 to withdraw a “tiny little gossip” published in the newspaper that stated that the author wrote for the “Pszonka”. Juliusz Słowacki was a guest and collaborator of the Polish Club. He was part of the club’s Economic Council and occasionally fulfilled the role of chamber director which involved mediating too lively of discussions. 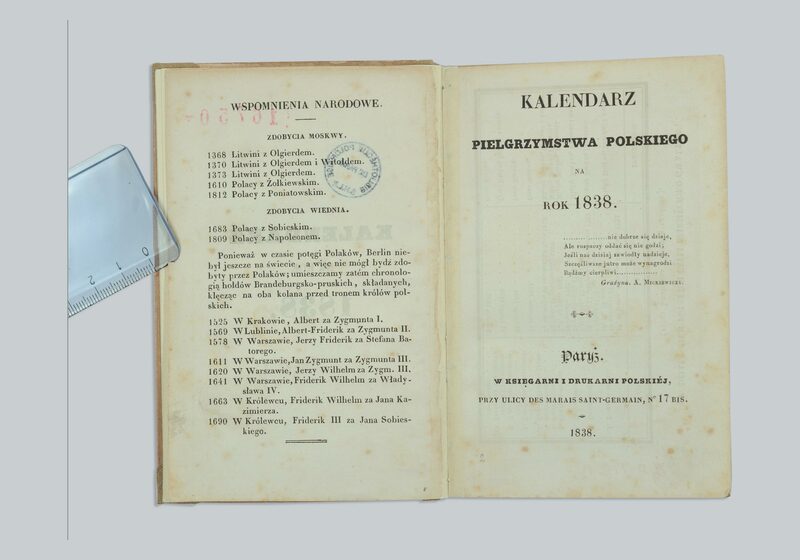 “Kalendarz Pielgrzymstwa Polskiego” (The Calendar of Polish Pilgrimage) was published by the Polish Printing-house and Bookstore that was established 1835 by Aleksander Jełowicki, Eustachy Januszewicz and Stefan Dembowski. Until 1840 the Printing-house published over 30 titles. The Polish Library earned part of its revenue through raffles. “Bricks” which were sold via the raffle were identified by attached labels. 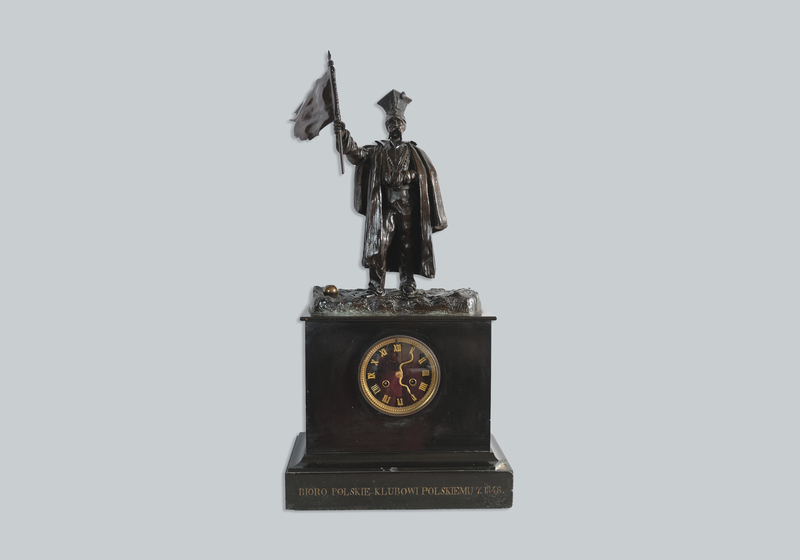 The engraving was created to celebrate the occasion of the Polish Library director Franciszek Pułaski’s jubilee. From the beginning of his term in office Pułaski had urged for a renovation of the Libarary’s building as well as an increase in the collections. He was director until 1956. During WWII he conducted the evacuation of the collection, part of which was hidden in Parisian institutions and across the province. 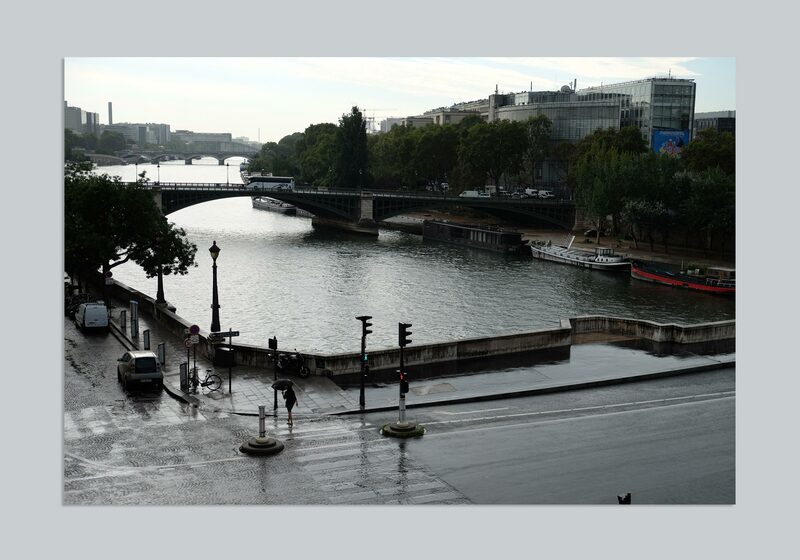 The Polish Library’s windows open onto the Seine river and the Île de la Cité. Looking to the right Notre Dame’s presbytery is visible. A particularly striking statue of St. Genevieve is found on the Tournelle bridge which leads to the Polish Library. It was created by Paul Landowski, a French sculptor of Polish descent. He is well known as the creator of Rio de Janeiro’s Christ the Redeemer. 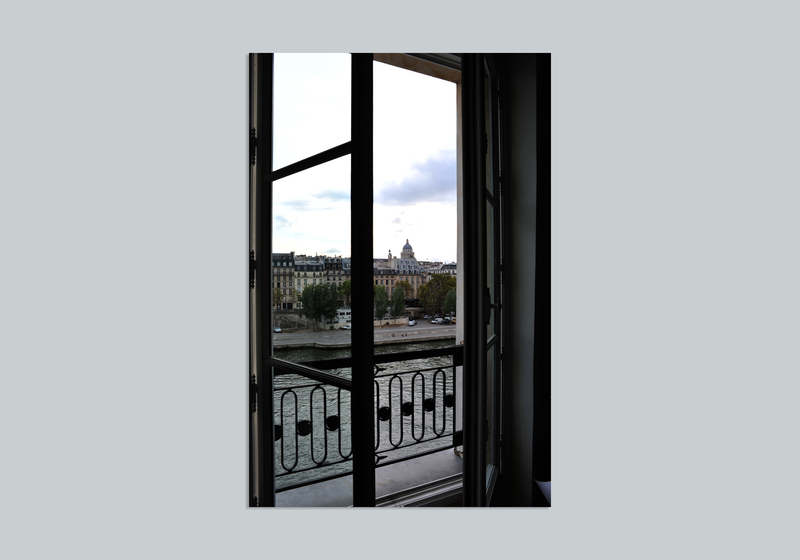 From the second story window of the building near the Quai d’Orléans the dome of the Parisian Pantheon is visible. 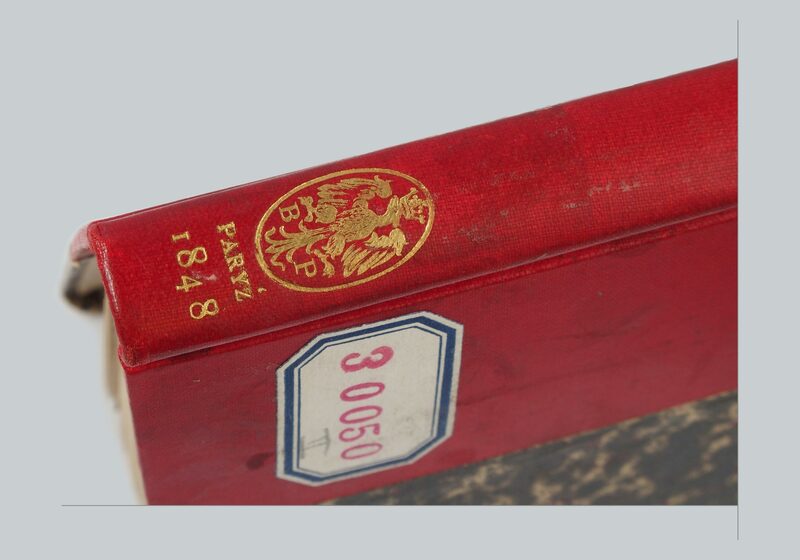 The Polish Library’s 1865 resolution outlines its organizational structure and goals. The Library’s identifying symbols changed over time. Multiple types of bookplates and seals were used throughout the years. 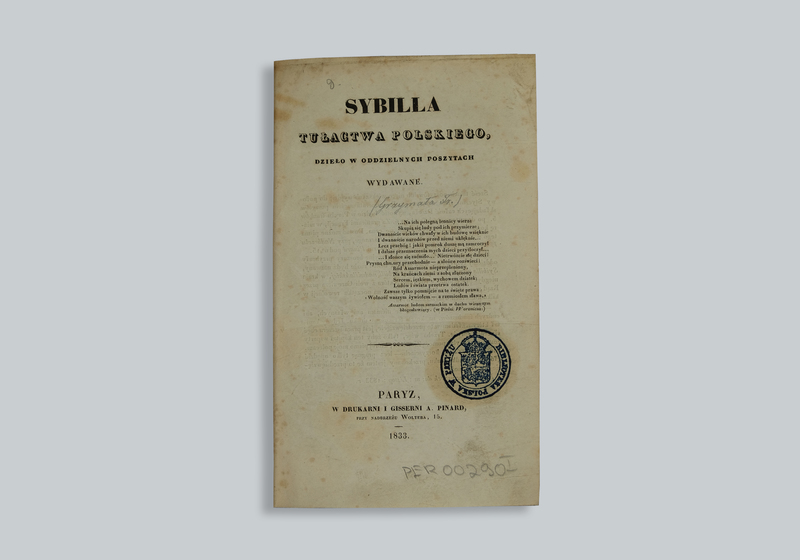 “Sybilla…”, distributed by Franciszek Grzymała between 1833 and 1835 was dedicated to past and present socio-political matters. 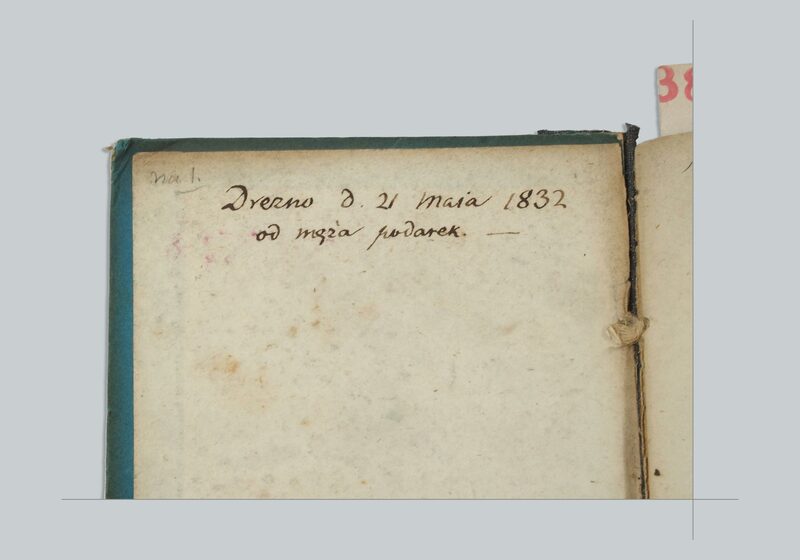 The identifying symbols on the page show the journey of the book – from the Polish Democratic Society’s library, through the collections of the Polish school at Batignolles (est 1842), finally landing in the Polish Library in Paris.